For nearly two decades the mighty Linn ‘HafTrak’ was without peer. Approximately 2,500 examples of the ‘torque monster from Morris’ were produced between 1917 and 1948, and thanks to a rabid fan base, they remain popular today, attracting a crowd whenever the handful of remaining operational Linns are shown or operated. 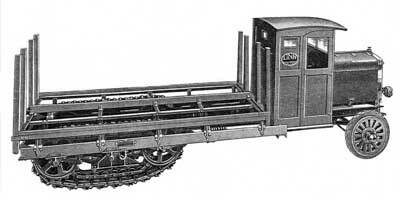 Although Linn's early tractors were visually similar to the logging tractors manufactured by his former employer, Alvin O. Lombard, the track systems differed enough that both men received US Patents on their respective designs; Lombard favored a rigid track - Linn a flexible one. 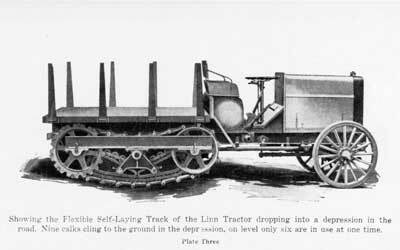 Clearly Linn's tractors were based on Lombard's concept, but a close examination of the respective patents reveals no infringement, at least where the tracks are concerned. If either inventor had bothered to apply for a patent on the overal design of the two units, the case would not be so cut and dried. H.H. 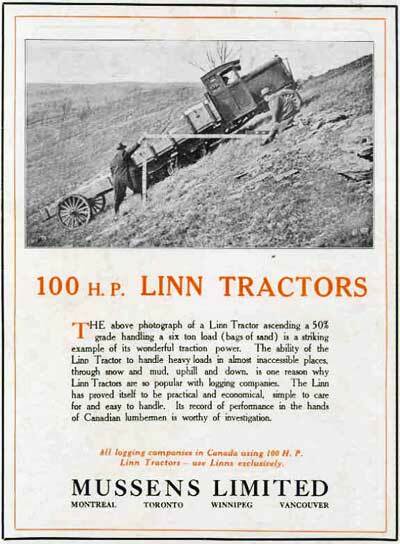 Linn’s patented ‘Flexible Traction’ units gave the Linn tractor a distinct advantage over a conventional motor truck enabling it to traverse rock-strewn, muddy or hilly terrain previously inaccessible by a motor vehicle. 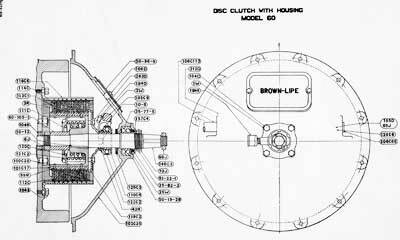 Power was transmitted to the ground via the rear crawler tracks which included a spring-loaded steel triangle, pivoted at its apex, which allowed the track bed to flex and conform to the contour of whatever surface the Linn might encounter. 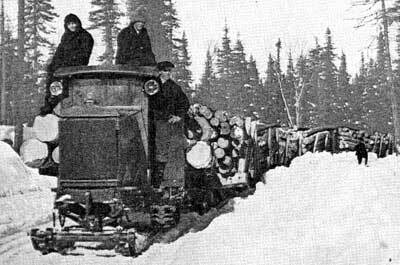 The Linn proved popular with loggers, miners, contractors and municipalities, serving double duty as a road-building machine during the summer months and a snowplow during the winter. 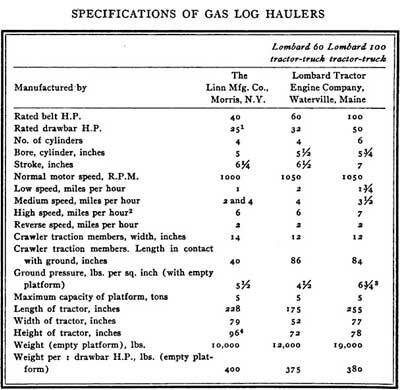 Under ideal conditions company literature claimed the Linn could travel up a 50% incline and some customers, particularly Barrie, VT’s Vermont Marble Co. stated their Linns regularly carried a 20-ton load up a 22% grade. 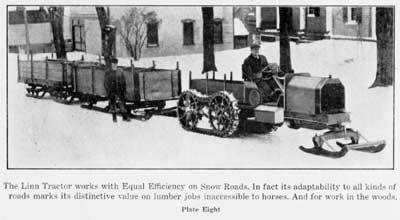 When equipped with skis a snow-going Linn road train, (1 or 2 Linn tractors towing from 10 to 16 log sleds) could increase productivity 10-fold, with numerous North American logging and mining outfits testifying to their efficiency in Linn advertising. 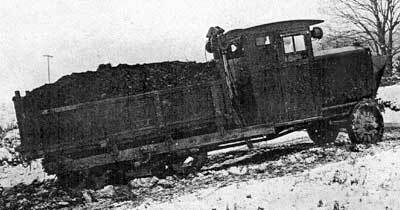 One Linn snow train, operated by the Hudson Bay Mining & Smelting Co., Ltd., pulled a 120 ton load from their supply depot to its Flin Flon, Manitoba/Saskatchewan, outpost and the Amtorg Trading Co. exported numerous Linns for use in the Russian province of Siberia. Linns were also popular in warmer environs, a number of units were exported to the Middle East, as well as the Panama Canal Zone where they were used for canal, roadway and railway maintenance. 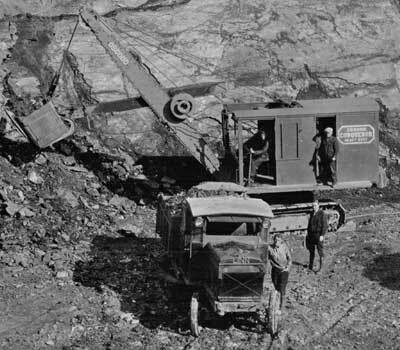 During the 1930s Linns equipped with 5-10 ton rock bodies were used by contractors engaged in the construction of the Bonneville, Chickamauga, Guntersville and Grand Coulee Dams and helped construct the Canadian Oil (Canol) oil pipeline in Alaska. 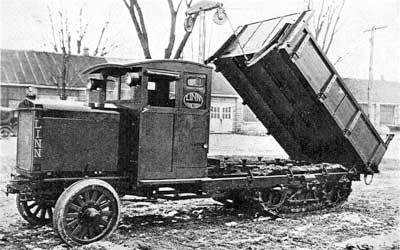 Linns were delivered fully-equipped, with the customer offered a vast assortment of bodies which included the standard 8-9 yard dump body, side-tipping rock bodies from 5 to 15 yard capacity, and purpose-built haulers equipped with Gar Wood and St. Paul hydraulic hoists. A 25-yard model 37-T flexible-tracked dumping semi-trailer was also offered, but there were few takers. 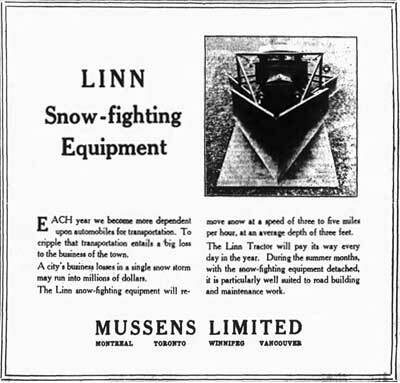 Numerous New York municipalities owned Linn snowplows, which could be equipped with their choice of snow-fighting equipment manufactured expressly for the Linn by Champion, Frink and Sergent. 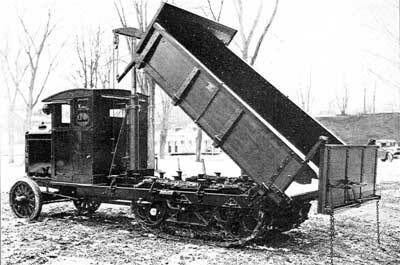 Early models equipped with bi-lateral wing plows required from two to three operators, plus the driver, but later units offered hydraulic control, allowing a Linn plow to operate with just a single operator (plus the driver – a necessity as the Linn could be a handful to drive in inclement weather). Early Linns were equipped with 4-cylinder Continental Red Seal engines while later editions could be ordered with a wide variety of power-plants ranging from four- and six-cylinder Waukesha and Hercules gasoline engines to the six-cylinder Cummins diesel torque monster. From 1929-on Linn was owned by American LaFrance and a handful of Linn prototypes were equipped with American-LaFrance V-12 gasoline engines. Early Linns were limited to a top speed of 5-6 mph, although later units equipped with the big Hercules 6-cylinder could reach a top speed of 12 mph. The firm’s swan-song was the 1939 Linn C-5 convertible tractor truck, which could be operated as a standard Linn off-road or as a conventional truck (albeit with front-wheel-drive) while on the road. 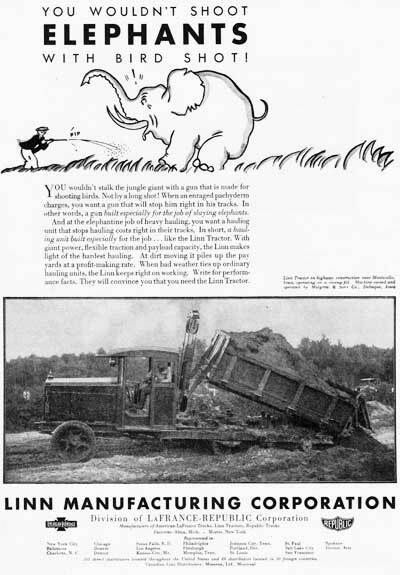 Unfortunately the C-5 came one decade too late as Linn’s main customers - municipal highway departments - were already bandoning their Linns in favor of more modern and versatile road-building and maintenance equipment offered by Walter and FWD, and shortly after War’s end, Linn quietly withdrew from business. His mother, Lucretia A. Currier was born on Dec. 4, 1852 at Fort Fairfield, Aroostook County, Maine to Henry C. and Mary (Stevens) Currier (farmers) being the youngest of 8 children. 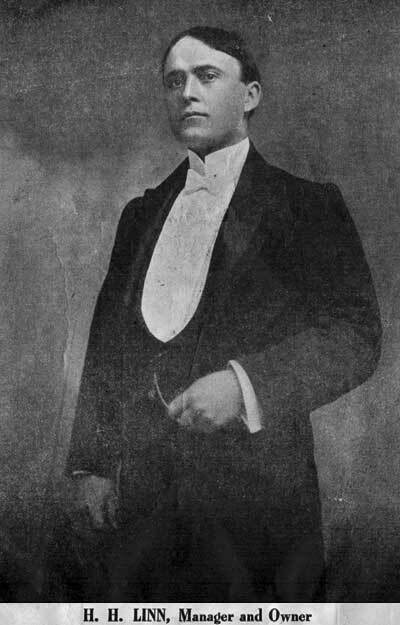 His parents’ marriage ended in divorce in 1883, and his mother left Washburn and moved to Old Town, Penobscot County, Maine (North of Bangor) to re-establish her life. In 1892 she married a Scottish-born confectioner named Robert D. Linn (b. June, 1850) and shortly after their marriage, 16-yo Holman left his father’s farm to live with his mother and stepfather in Old Town, securing employment as a weaver at the Old Town Woolen Co. Linn's meager income was supplemented by a part-time job at a local shoemaker where he became proficient at operating a McKay leather stitching machine. Linn also joined Herbert Percy's Band and on holidays and weekends toured the region providing musical entertainment to the culturally deprived residents of rural New England. The 1900 US census lists his name as Holman H. Flannery (occupation, musician), but shortly thereafter he changed his last name to Linn. The Linn household also included Elery C. Currier (b. Jan. 1880) who was also listed as a stepson of Robert D. Linn – his occupation salesman of confectionaries (aka Ellery C. Linn). On one playing engagement in Berlin, New Hampshire, Linn became infatuated with a divorcee named Mrs. Edward Wheeler (Grace Goravilla Gay b. Nov. 9, 1870 in Tunbridge, Vermont to Orrin Albert and Estella J. [Richardson] Gay), and the two married on June 2, 1900. Grace was a musician and singer and her enterprising husband decided to form a roadshow to showcase her considerable talents. 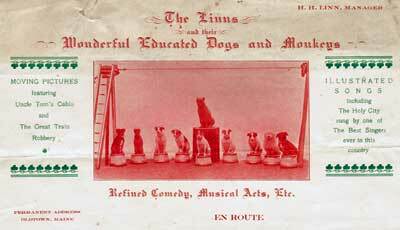 Performing canines were popular at the time and within a few short months Linn had trained a number of pups to perform various tricks, with the performance augmented by the newlyweds singing the latest popular songs accompanied by Grace's portable reed organ backed by scenic views projected by a magic lantern. Soon after Linn added motion pictures to the attractions, projecting such crowd favorites as the Great Train Robbery (1903) and Uncle Tom's Cabin (1903). 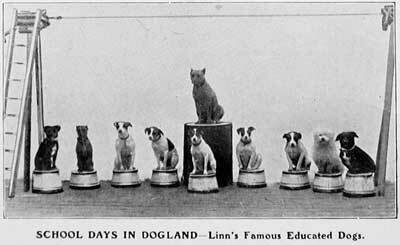 In their early days 'The Linns and their Wonderful Educated Dogs and Monkeys' travelled by horse-drawn wagons, which was later acccompanied by H.H. Linn's horseless carriage, which could be seen in return for a 10¢ fee. 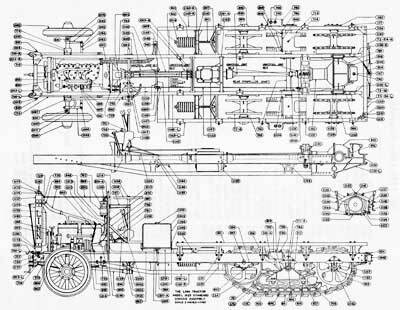 As the size of the entourage increased Linn became engrossed with building his own road locomotive and in 1906 designed a road going vehicle which utilized two upright Brennan gasolene engines connected via a jackshaft and bi-lateral chains to the two rear wheels. 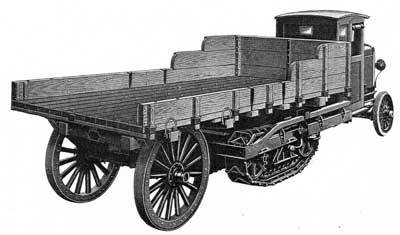 The road locomotive was constructed in the carriage shop of John Gould in Old Town, Maine and created a sensation wherever the Linn's performed. By 1908 black face comedian G.E. 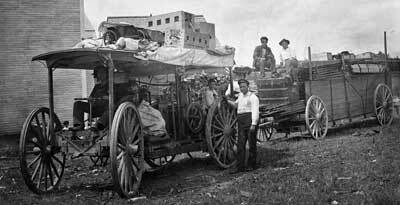 Follette, wire artist Mavolio, and serio comic Princess Madeline had joined Linn's entourage, necessitating an even larger road locomotive, which was now tasked with hauling three trailers full of equipment. 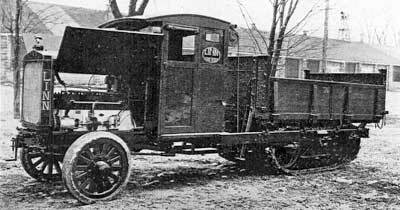 The second iteration of Linn's road locomotive would be fully enclosed for travelling during inclement weather and in the fall of 1909 he commissioned the Lombard Tractor Co. of Waterville, Maine to construct it. 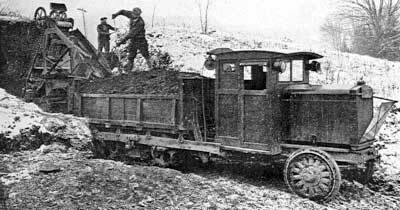 In 1908 Lombard had constructed a gasolene-powered prototype based on the a 5-ton Lombard steam tractor using a rear-mounted 50-hp Brennan engine powering the twin ‘lag beds’ or ‘lag tractor treads' (better known today as a 'Caterpillar treads'). 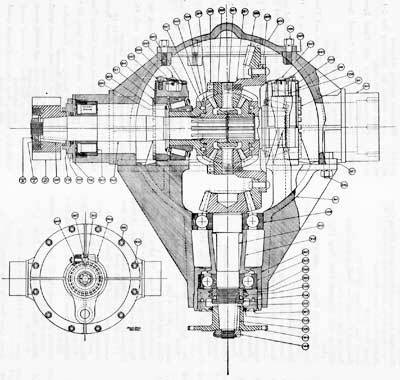 The flywheel resided at the rear of the engine, the front-mounted driveshaft delivering power to a 2-speed transmission (2-forward, 1-reverse) that were connected to the sprockets via chain drive. Cooling was supplied by four cast-iron house radiators with an expansion tank created from a wooden barrel. 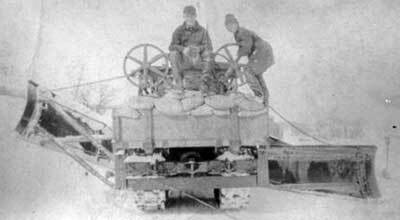 Unlike a standard Lombard steam tractor, the driver of the gas-powered Lombard sat at the very front of the vehicle directly above the front wheels/skis. “New Use for the Automobile. “C. Lombard Company of Waterville, Me., manufacturers of the famous Lombard log hauler, has made one of the most unique arrangements for a traveling circus that has ever been seen. It is a car for the use of the H. H. Linn dog show. A car 26 feet long and 6½ feet wide has been completed for the proprietor of the show, and is set over a gear similar to that which propels the hauler. By means of this car, which is fitted up into a comfortable traveling home, the carts containing the equipage of the show will be taken from place to place. A Brennan 4-cylinder gasoline engine of 50 horsepower propels the running gear, and the machine can travel over any kind of a road at the rate of four miles an hour. By means of a truck in front turned by a work gear, the car can be steered, and it can also be run in the winter time by placing runners in front instead of the wheels. 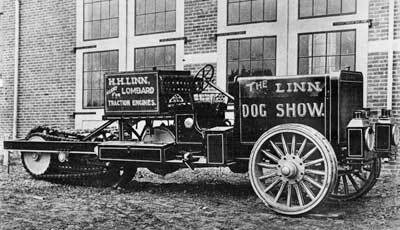 Lombard constructed a second machine for Linn, the second, being a purpose-built demonstrator that Linn used to advertise Lombard tractors, as he had now taken a part-time position as a Lombard representative when his 'Dog Show' was on haitus. Equipped with a single rear lag bed, the second vehicle looked remarkably similar to the tractors that H.H. Linn would soon produce under his own name, albeit Linn's would be quipped with a pair of lag beds for better stability. While working for Lombard, Linn (aka 'The Showman') spent his winters visiting New England logging camps where he demonstrated Lombard's latest gas-engined tractors, providing much-needed feedback to the Waterville factory as to improvements in future products. Linn parted ways with the Lombard organization in 1915 due to his displeasure with the fact that Lombard had applied for a number of U.S. 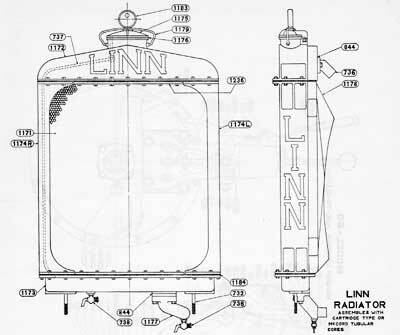 Patents on improvements suggested by Linn without giving him credit. 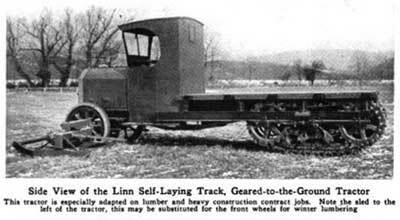 Linn resolved that he would build his own gasolene-powered caravan and in the summer of 1915 he commissioned Syracuse's Brennan Motor Co. to construct a prototype chassis which included a new fully flexible track unit of Linn's design which allowed the tracks to maintain full contact with the road surface regardless of the terrain. The Linn's also decided to leave Maine for good and in October of 1915 they purchased a home in the small Otsego County, New York village of Morris, which was located 70 miles southeast of Syracuse. The latest local celebrities were granted permission to house their animals and show equipment at the Town of Morris fairgrounds during the winter and Linn set about completing his latest caravan in a Lynn Kenyon's carriage shop. The new caravan was completed by spring of 1916 and the Linns embarked upon their annual tour of New York and New England. Midway through their summer tour a serious outbreak of Polio occured among Italian immigrants in the city of New York forcing the NY State Health Department to enforce a travel ban in a number of counties boardering Westchester County and Manhattan. In the interests of public health neighboring states quickly followed suit and the Linn's were forced to abandon the remained of their 1916 summer tour. 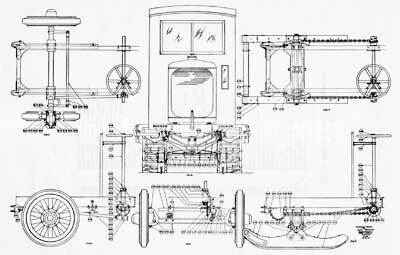 They returned to Morris and Linn decided to embark upon the manufacture of his own tractor utilizing the new track system he had developed for his latest caravan. Linn found a number of willing investors in and around Morris and by late fall had made arrangements for the incporation of the Linn Manufacturing Corp. Original investors included Lynn Kenyon, R. R. Ripley, Dr. L.R. Morris and George Whitman, cashier of the Morris First National Bank, and the village fathers offered up an old abandoned grist/lumber mill for a factory site. “The old saw and grist mills near the fair grounds have been torn down to make room for the new buildings of the Linn Tractor company. The foundations for the new buildings will be started this week. The new factory was located adjacent to Butternut Creek wher they constructed a hydroelectric generating plant that was powered by a 12' x 13' diameter 60 hp Fitz steel overshot waterwheel which was hung by Linn's own hand. The excess power generated by Linn's hydroelectric plant was sold to the local municipality through the Linn-controlled Morris Electric Light and Power Company. Unlike most manufacturing plants of it's day which featured stationary engine-driven shaft and belt power tools, Linn's adoption of electric power created a much cleaner and safer factory environment, as each piece of machinery was powered by its own electric motor. 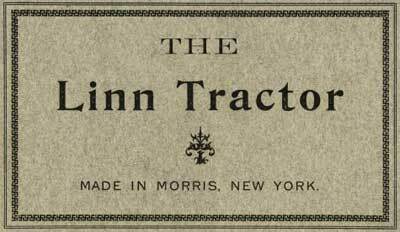 The first production Linn tractor was sold to Charles Brook, a Mt. 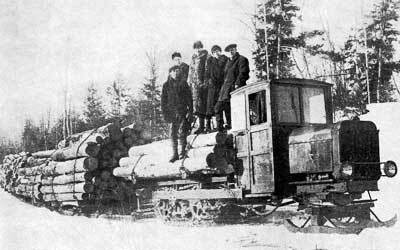 Upton logger; the second, to Fitch Gilbert, who used it to haul material from Gilbertsville to a hillside tract where he was constructing a new summer home. 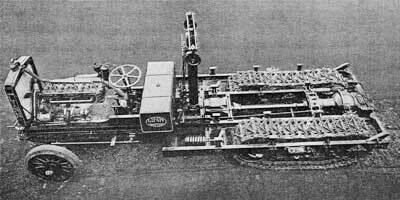 The tracks on the very first Linns suffered from a poorly designed hollow-steel rollers whose wood cores crumbled under hard use. They were quickly replaced with solid Manganese rollers furnished by the Taylor-Wharton Iron and Steel Co. of Highbridge, New Jersey. “The experience over in the Butternut Valley should be worthy of more than passing notice. As noted in ‘The Star’ of yesterday, when it became impossible for the trucks to carry the milk from Morris and vicinity to Mt. Upton, the shipping point, a Linn tractor was hitched to a couple of road machines and the highway was cleared to a width of 14 feet and truck and other motor driven vehicles are passing over it. The cost was trifling compared with the monetary value of the use of the highway. 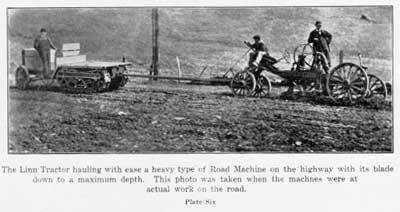 “With the Linn tractor mounted at the front upon runners and guided by the sturdy team of Charles E. Thompson of South Side and a heavy road machine in tow the state road from Oneonta-Otego was opened yesterday in good shape for light motor cars as far as the farm of Charles E. Nichols. Weather permitting, the town superintendent, aided by Mr. Thompson and others of his force, will continue on this road today with every indication that it will be opened to Otego and perhaps beyond. The tractor was kept in the road with this means of guidance and it performed admirably, demonstrating that the snow can be cleared from the highways in first class manner by this method. Of course Oneonta delayed until the snow was packed in the roadway, which rendered the task extremely difficult. “From the Pond Lily corner to the farm house of H.L. Day the second road machine was kept in motion during the greater part of the day while the contrivance was being rigged for guiding the tractor. Attached to it were the teams of M.G. Keenan and Charles Nichols and they pulled true, and the drifts in that section had been lowered when the tractor arrived shortly after 1 o’clock. The roadway is well packed where the snow could not be cut close to the macadam and while it was not deemed advisable to attempt to use the highway with big trucks or motor buses, the light cars will make it comparatively easy. Below the Day farm there were encountered few drifts and road is in quite good condition except in one stretch for a few rods were a bit of shoveling will be done early today. 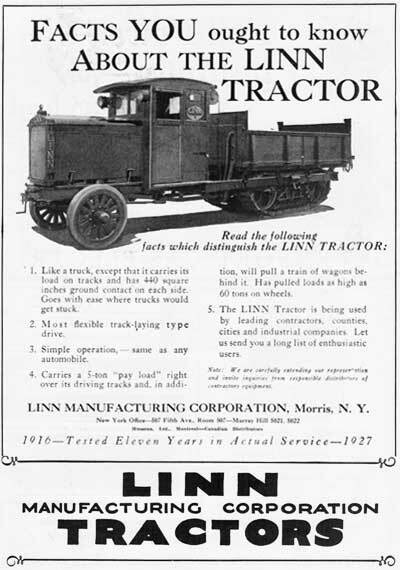 “The Linn tractor, manufactured by the Linn Manufacturing Corp., Morris, N. Y., is a self-laying track machine and is especially adapted to work on wood or lumber jobs, or heavy construction contracts, because it can do the work of ten teams, and it can travel over roadways in the woods and on soft ground where horses cannot go and draw a paying load. The tractor is claimed to be able to pun four times its own weight over ordinary roads, winter or summer. To perfect the traction power of a revolving track, a flexible traction member was invented, which will adjust itself at all times to any unevenness in the road or field which it might encounter. This is an improvement over the rigid self-laying track as they often encounter spots or depressions and they have no traction at all. The construction of this track has been simplified, as not a bolt or nut is used in this traction member aside from the hangers which carry the axles. The sprockets and track-links are said to have an unusually long wearing surface. The track link joint has a 15-16-in. hardened pin, 13 in. long, that floats and has bearings its entire length. The anti-friction rolls are of ample size and strength and carry no weight on their axles. “The Linn tractor is made of such units as a Continental, Red Seal engine, Bosch magneto, Schebler carburetor, Brown-Lipe transmission and Brown-Lipe-Chapin differential, and Sheldon front-axle. “The four-cylinder, vertical, L head type, Continental engine, has a bore and stroke of 4 1/4 x 5 1/2 in., respectively. Engine speed is controlled by a Pierce governor. The crankshaft bearings measure 3/4 in. front, in. middle, and 4 15/16 in. rear Gasoline is fed by gravity from a fuel tank having a capacity of 3054 gal. through a Schebler 1/4-in. carburetor, which is equipped with a hotspot manifold. Ignition is through a Bosch magneto. 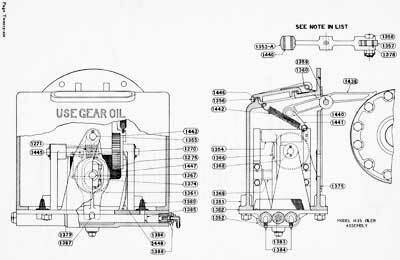 The splash and force feed system of lubrication includes a Continental, double-plunging oil pump and a Morris oil indicator on the dash. “Cooling water is circulated over the cylinder head and valve seats by a centrifugal pump. The radiator is honeycomb type and is a Mayo make. Cooling air is sent through the radiator by a large Oakes fan driven by a belt. 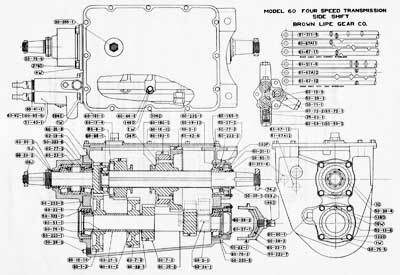 “The sliding gear transmission- system which provides four speeds forward and one reverse is the Brown-Lipe, fourspeed, Model 60 transmission. This transmission provides the following speeds and normal pull in lb. : First or low, 1 mile, 12,000 lb. ; second, 2 mile, 8000 lb. ; third, 4 mile, 3500 lb., and fourth, 5 1/2 mile, 2000 lb. 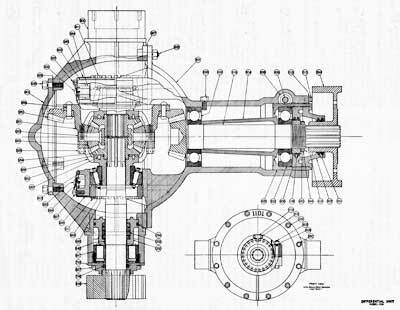 Differential is a Brown-Lipe-Chapin and final drive is internal gear. “The front axle is a Sheldon, equipped with roller bearings and carrying two front wheels equipped with 36 x 5 rubber tires. “The length of a Linn tractor is 198 in., width 74 in., height 36 in., to the top of the cab, wheelbase 111 in., size of body, 9 ft. by 5 ft. 4 in., outside turning radius ft., weight packed for shipment 9000 lb. Iroquois Farms, A. Treyl & Co., Livingston, Manor, N.Y.
Highway Supt. Town of Oneonta, Oneonta, N.Y.
C.A. Goff & Sons, Kenwood, N.Y.
Highway Supt., Schuyler Lake, N.Y.
Highway Supt., New Berlin, N.Y.
Arthur Leighton Co., Cooks Falls, N.Y.
James Mfg. Co., Kane, Pa.
Vandilla Chemical Co., Olean, N.Y.
Fitzpatrick & Weller, Ellicottville, N.Y.
A.B. Smith Chemical Co., Red House, N.Y.
Highway Supt., Town of Middlefield, N.Y.
Highway Supv., Mr. Button, Town of Columbus, New Berlin, N.Y.
Highway Supt., Howard McPherson, Town of Bovina, Bovina Center, N.Y.
Highway Supt., Town of New Berlin, N.Y.
Corbett & Stewart, Corbett, N.Y.
J.E. Cannan (Camp #7), Forestport, N.Y.
Oxford Basket Co., Oxford, N.Y.
Highway Supt., Town of Smithville, Smithville Flats, N.Y.
Wyman Chemical Co., Port Alleghany, N.Y.
Moyer & Pratt, Lyonsdale, N.Y.
Blount Lumber Co., Laconia, N.Y.
United Block Co., Crogan, N.Y.
United Block Co., Chaffee, N.Y.
Warner Sugar Refining Co., Roulette, Pa.
B.H. Baird, 786 Michigan St., San Francisco, Cal. Carter Oil Co., (Mr. Cooper) Parkersburg, W.Va.
Highway Supt., Town of Burlington, West Burlington, N.Y.
Clyesdale Motor Truck Co., Pearl St., Toronto, Can. Potter, Burton Lumber Co., Fort Ann, N.Y.
A. Sherman Lumber Co., Potsdam, N.Y.
Young Bros., Lumber Mfrs., Elmira, N.Y.
Hugh Nawn Contracting Co., Gilboa N.Y.
C. Fred Johnson, (Mr. Burton) Johnson City, N.Y.
Charlotteville Creamery Co., Charlotteville, N.Y.
Mr. Geo. Polley, Andes, N.Y.
Baggs Machinery & Supply Co., Baggs, Wy. J.S. Avery, New Milford, Pa.
Dale Engineering Co., Mann Bldg., Utica, N.Y.
Dale Engineering Co., East Springfield, N.Y.
Brooklyn Cooperage Co., St. Regis Falls, N.Y.
Highway Supt., Town of Norwich, Norwich, N.Y.
Chas. P. Root, Gilbertsville, N.Y.
Highway Supt. (Mr. Robbins) Bainbridge, N.Y.
E.A. Schubert, Room 312 MacClain Bldg., Roanoke, Va.
“Morris, Dec. 7. – The Linn Tractor Corporation, which was established here several years ago and by steady growth has become the leading manufacturing industry of the Butternuts Valley, was reorganized on Friday last. Much new capital from New York City and vicinity has become interested in the enterprise and the new investors have purchased the stock of local men, who in the beginning aided in putting the business afloat. The former stockholders have disposed of their holdings at $175 per share, which is now being paid; and in addition to this sum, the old stockholders will receive a dividend of 11 percent, payable January 15, from the business of the past 11 months, bringing the actual selling price up to $186 per share. “Satisfactory as this is from a business standpoint, the residents of Morris are even more gratified to know that the business will be continued in this village and that the output will be greatly enlarged. It is a good business, paying good wages; and additional men are being put to work. “H.H. Linn, superintendent of the Linn Tractor corporation, and Earl Southern and Ralph Porter, employees, left last Friday for a lumber camp in the Adirondacks, where they will demonstrate the efficiency of the Linn tractor to interested parties in that section. 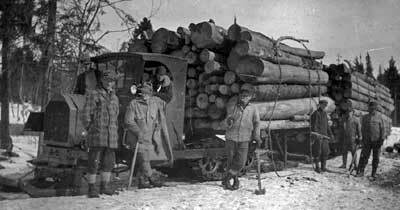 Tractors have already been placed in several lumber camps up north and are giving satisfactory service, according to reports. 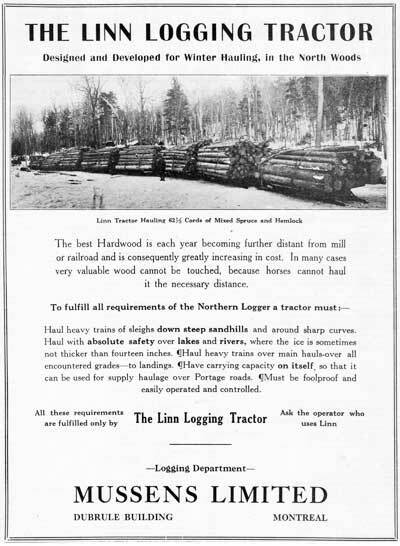 Loggers used Linn tractors to replace teams of draft horses which had been used for over a century to haul sleds of harvested timber out of the inaccessible backwoods of the Adirondack and Catskill mountains. 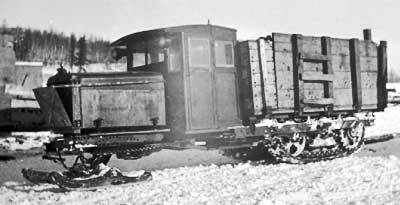 Linns were often called upon to haul a half-dozen or more leds, which were often equipped with a sled-mounted shanty at the rear (aka caboose) which contained a pot belly stove to keep the operators warm (and alive) in case of blizzard or mechanical breakdown. “The St. Maurice Paper Co. of Cap Madeleine P.Q., have recently completed a test of Tractor Efficiency in the movement of logs - at their operations carried on at St. Donat, which is located 35 miles north of St. Agathe des Monts, Quebec. The test was carried on over woods roads - newly opened this season - and over a governing grade of 18 per cent. It was found possible to continually haul three trailers over this four mile route and move 180 logs on each trip, and with a minimum of four round trips each day, a total of 720 logs a day, and by the same schedule 4,320 logs per week. It is estimated that with one tractor and three trailers to each train (9 trailers in all) one of these tractors can accomplish the work of 12 teams. 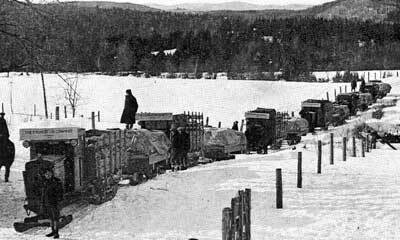 The trailers used were not special equipment but were built complete by the St Maurice Paper Co. in their blacksmith shop at St. Donat. They are of the conventional type of heavy duty sled as manufactured by the Adams Wagon Co. at Woodstock, with but slight changes made for purpose of proper tracking with tractor on curves. Northern New York's 'snowbelt' - which is concentrated along the Tug Hill plateau, a geographic feature that extends east from Lake Ontario into the Adirondack Mountains - averages more snowfall than any other section of New York State. 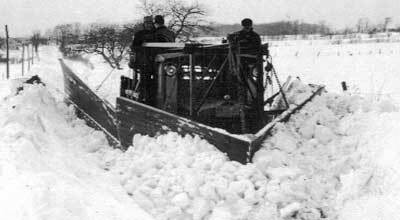 While Linns had been used in downstate New York to help traverse snow-bound roads, no mention of a snowplow-equipped Linn can be found prior to the winter of 1920-1921 when Jefferson County's F.W. 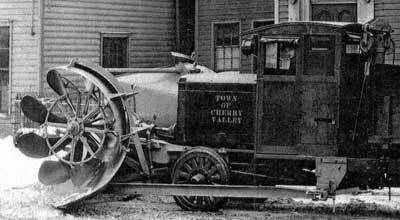 Carpenter, owner of the Black River Bus Lines, placed a Linn into service as a dedicated snow plow using an all-steel V-blade plow manufactured in the tire and machine shop of Carl H. Frink, of Clayton, New York. 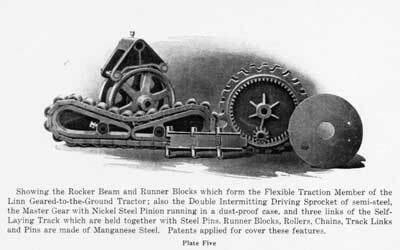 Carpenter's plow was not Frink's first, as one year earlier he had constructed a similar apparatus for Fred I. Dailey's Clayton to Watertown bus line. The news did not escape H.H. Linn who immediately set about constructing his own prototype V-blade plow out of wood. 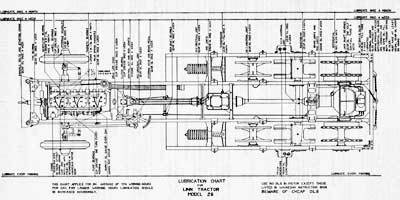 Once tested, he made arrangements with the Marathon, New York plant of the Good Roads Machinery Co. (headquartered in Kennett Square, Pennsylvania) to supply Linn with a plow designed specifically for use with the Linn. 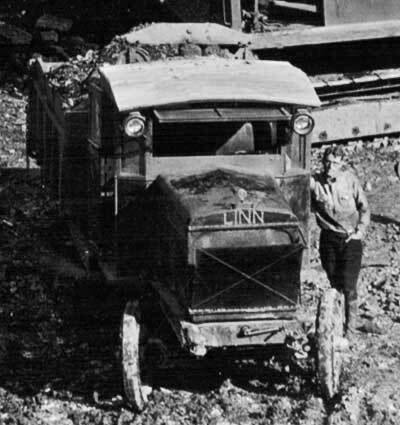 Five years later Linn chose to partner with Carl H. Frink, who by that time was manufacturing a line of plows far superior to the Champion. The Linn's rear tracks could be fitted with 3 different styles of tread (aka grousers or creepers); 1) Rubber Pad - cushioned for everyday use on paved, poured or brick roadways; 2) Ice - agressive metal feet that provided traction on glare ice; and 3) State Road - a less-agressive metal pad that provided sure footing in mud, dirt, or snow. “For the Linn Tractor which will arrive in town on Sunday night or Monday morning. 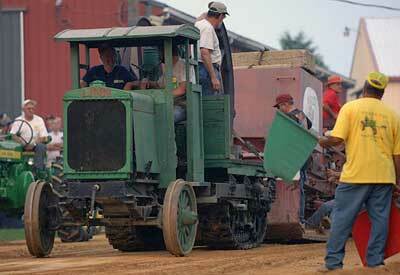 The Linn Tractor is a heavy duty, heavy hauling machine of track-laying type. This tractor has been purchased by Vad’s Express to run between North Adams, Williamstown, Pownal and Bennington, Vermont. “Excellent Movies of Linn Tractor Working During Heavy Snows of Past Winter Shown at Theatre. “In conjunction with the picture program shown at the Oneonta theatre last evening were two reels depicting the work done in clearing the heavy snows of the past winter from Belden Hill by Linn tractors. Not only because of the particular interest of Oneonta and vicinity people in pictures of territory which they know well was the picture appreciated, but as well because of the work of the Linn tractor made at Morris, which has a host of friends throughout the vicinity where the powers of that machine are particularly well known. 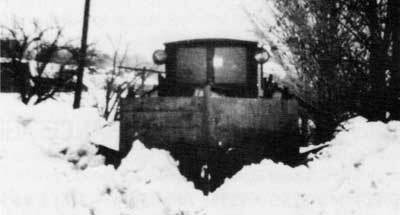 “The film was of two reels and showing the Linn tractor with its special plows arriving on the scene at Belden Hill, which was blocked with snow. 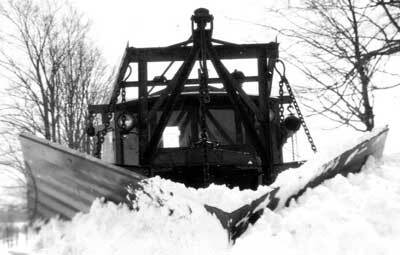 The main ‘V’ type plow opened the roadway through the deepest drifts while the side wings were operated by the members of the crew of the machine to make a double pathway through the drifts. “There was very little shoveling as is common with most road plows, the big Linn with its weighted body making its way into the deepest of the snow and plowing steadily along with scarcely a pause. And due to the fact that the plow operated to push the snow on both sides there was no tendency to sideslipping as is common with many plows of other types. “The funeral of Robert Linn, who died at Edmeston, was held at that place Saturday afternoon and was quite largely attended by Morris people. Among them were Mr. and Mrs. H.H. Linn, Mr. and Mrs. Charles Gage, Mr. and Mrs. Scott Lull, Miss Helen Colvin, Rev. and Mrs. F.G. Leonard. “Mr. Linn was a former resident of this place and moved to Edmeston after the death of his wife. He was the father of H.H. Linn of Morris and E.C. Linn, formerly of Morris and Edmeston, but now of Saranac Lake. Rev. F.G. Leonard assisted the Edmeston clergyman at the funeral services. “H.H. Linn of Morris To Tour South in One of Finest Motor Coaches on Highways. “Mr. and Mrs. H.H. Linn of Morris will leave about November 10 for a winter trip through the South, combining business with pleasure and since Mr. Linn will establish agencies for the best tractor in the world, the Linn Tractor made at Morris, it is only fitting that the trip should be made in one of the most sumptuously equipped Pullman busses on the highway. The chassis is to be the Safe-Way Six wheel type, costing about $7,000, and the body will cost about $9,000. This will bring the total cost of the seven ton equipage to about $17,000. “And before any extended description of the new Pullman is given it might be well to tell about the traveling bungalow in which Mr. Linn visited Otsego county in 1907-1908. At that time he owned a pony circus, and had an especially equipped vehicle, quite as much of an advanced step in those days as is the splendid coach in which he will travel and live this winter. 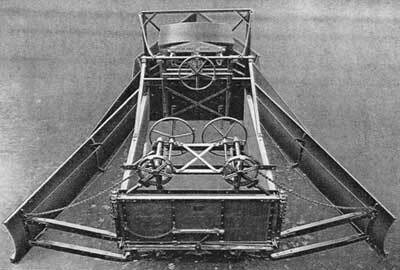 “The machine was built to his specification, and the chassis was 30 feet long. It was powered by a 100 horse-power motor which gave a road speed of four or five miles an hour. The car steered on four wheels. “But the rear two wheels were not round. 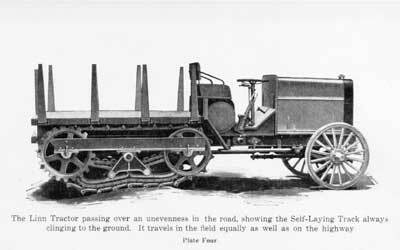 The rear traveled on tracks similar to those in use as driving wheels on the Linn tractor of today. 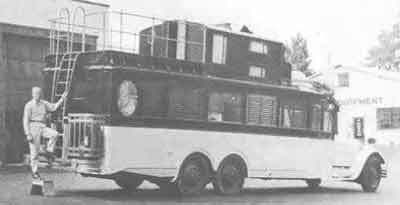 “The body was made by a ship cabin builder, and the bus was fitted with a ship stove, refrigerator, and other conveniences. About the only obstacle to traveling wherever business led was the fact that the body was too high for many of the bridges in use at the time, and detours were sometimes necessary. “Description of the Latest Bus. “After much deliberation and investigation of the larger motor busses, Mr. Linn decided on the purchase of the Safe-Way six wheel chassis manufactured by the Safe Way Coach company of Philadelphia. It is powered by a six cylinder 110 horsepower motor and has a wheelbase of 165 Inches. “Two complete driving axles of the inverted worm type and four driving wheels are located at the rear of the chassis. 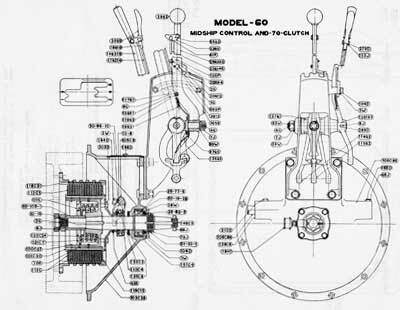 The axles are connected at the center with a very large torque tube of sliding sleeve type, allowing perfect action of the long side, three stage springs which connect the (missing text) frame pivoted at the spring center, making a very flexible driving unit and giving each tire of the four rear wheels it proportionate share of the load as well as of the drive. 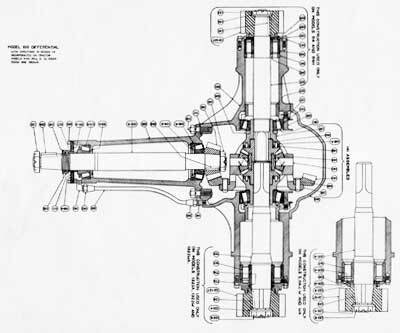 “The very latest Westinghouse air brakes, operating internal expanding shoes are used on all four driving wheels. Emergency brakes are manually operated. 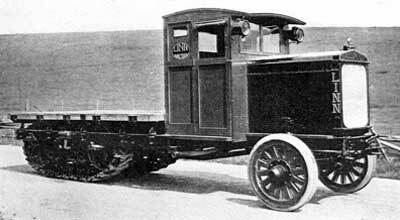 “The chassis was driven from the factory at Philadelphia to Cleveland, Ohio, a distance of approximately 500 miles, in less than two days by Charles E. Gage of Morris to the Schaefer Coach works, where the special body is now being built according to specifications of Mr. Linn. “The body is 23 feet six inches in length back of the cowl and seven feet seven inches wide inside. It is equipped with two complete lighting systems, the regular equipment connected with the motor and a special Delco 12 volt system to supply current for the iceless refrigerator, cooking utensils, electric fans, and other conveniences. “A Presto-Lite three-burner stove is installed in the very complete kitchenette, which has extensive cupboard space, and padded compartments for dishes and for the utensils for cooking three square meals a day. There is plenty of room provided for serving the meals. “The latest type of Pullman beds, equipped with air mattresses, a shower bath with hot and cold water, lavatory, sanitary toilet, clothes closets, and extra storage space have also been provided. All windows are large and provided with plate glass and fine copper screening. “The Pullman beds and five comfortable wicker chairs are upholstered in genuine taupe leather. With the bed folded, the coach will seat 16 people comfortably. “A brown khaki canvas 25 by 12 feet fastened to the baggage rail on the top of the coach will provide a comfortable perch when the lower ends of the canvas are supported on for small tent poles. Moving picture equipment with camera and projector and radio apparatus of latest type will also be included. “Of course, as those who know Mr. Linn and his ability as a salesman and of the Linn organization as manufacturers are well aware, this most luxurious motor coach is not wholly a pleasure vehicle. It is the intention of Mr. Linn enroute to establish agencies for the Linn tractor, which is fast becoming famous as an economical hauling unit and which is adapted to all kinds of heavy work, both winter and summer. After Linn sold his share in the firm to the Republic Motor Truck Co. in 1927, he traveled up and down the eastern seaboard in his coach which continued to be manned by his chauffeur and personal steward, Charles E. Gage. After Linn's untimely 1937 passing his estate sold the coach to Purcel Kingsley of Cohoes, New York, whose Hudson River Night Line operated a showboat steamship called the Buccaneer. Kingsley modified it into a roving billboard/shuttle equipped with a search light and sound system in which he picked up customers for Kate Parson's "Show Boat Revue” a risqué burlesque that took place onboard the Buccaneer once it left its mooring at Manhattan’s Battery Park. During Franklin Delano Roosevelt's 1932 presidential campaign, the Linn Haven ferried the future President and his entourage around Manhattan. In 1948 ownership of the Linn Haven passed to Hollis M. Briggs of Troy, New York, who used the vehicle for private excursions. The vehicle was retired in 1962, and was purchased a decade later by automobile collector John Rich. The vehicle was recently purchased at Kruse’s Fall auction in Scottsdale, Arizona and currently resides in the Martin collection in Houston Texas. 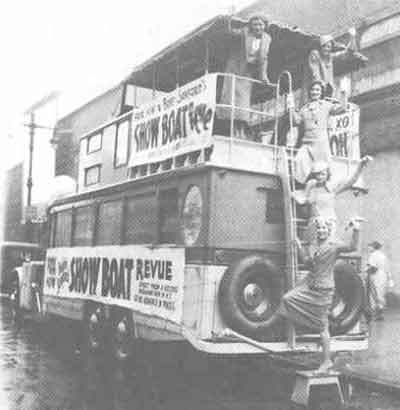 Kruse advertised the vehicle was used by Franklin Delano Roosevelt in 1932, and was used in the production of Showboat. It has sleeping quarters, a kitchen and a stage on the back. “The Linn tractor makers, whose factory is closed by the entrance to the grounds, makes as usual a fine exhibit. One of the big new six-cylinder machines, weighing 14,000 pounds is within a fenced enclosure and by the use of cables lifts itself by its own engine several feet from the ground at frequent intervals. It is a spectacular stunt and interests many. “The company has on display one of its big powerful motors on chassis but uncovered and its every feature indicates power abundant. It has two new features designed by the Waukesha Motor Company which are notable. One is a device which introduces hot air into the carburetor until the engine become heated and the other is to secure anchorage on the block above the compression chamber with which guards against the ganger of displacement sometimes encountered with high power motors. 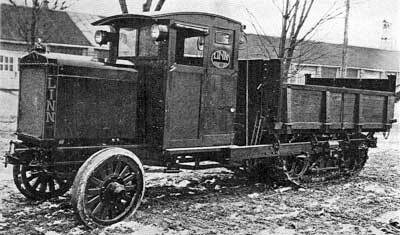 Upon its introduction the Waukesha-powered 6-cylinder Linn - which had an advertised top speed of 7 1/2 mph - was called the ‘County & Township Special.’ The Waukesha-powered 4-cylinder model was renamed the 'Contractors Special' and the benifits of itsshuttle shift (4 gears forward - 4 in reverse) and 360 degree pivoting driver's seat highlighted in promotiional materials. “G.B. Hanks of New York City, president of the Linn Manufacturing Corporation of Morris, was the speaker at the Rotary luncheon yesterday noon at the Elks club and after speaking briefly of the characteristics of the Linn tractor, moving pictures were shown of several of those machines hard at work on a construction job. The meeting was an instructive one and a number of interesting facts were brought out by Mr. Hanks in his address and through the pictures. “In his talk, he said that H.H. Linn had designed the tractor, not only for heaving hauling, but for heavy hauling under severe conditions and said that he was confident that Mr. Linn had had the greatest experience in this line of any automotive engineer. Mr. Hanks emphasized that the tractor was not built to sell and that the constructional details were not changed to reduce sales resistance: rather that the company built them from the experience of Mr. Linn, confident that greatest satisfaction would result from that course. “He emphasized the fact that the tractor must not only have a powerful motor, but must be able to place a large part of it upon the ground, where it would be of service. He remarked upon the importance of the tread of the Linn tractor, 3,500 pounds of manganese steel being used in the driving parts of every machine. “The pictures shown were taken by the Taylor Wharton Iron and Steel company of High Bridge, N.J., which supplies this material, and depicted Linn tractors at work, hauling a load of 65,000 ponds in one scene and in another two steel girders, 76 feet long. “The Linn tractor has opened the road between this town and Dover-Foxcroft, much to the satisfaction of many business men who make the trip through here weekly. “Messrs. Linn and Gage with Wives Leaving Today for Six Weeks in Pullman Bus. “Mr. and Mrs. H.H. Linn and Mr. and Mrs. C.E. Gage, all of Morris, leave that village today in the sumptuous Pullman but which Mr. Linn designed and had built according to his specifications and costing some $17,000 and in which the two couples toured through the south to Florida last winter, and have as their objective cities in Maine and thence to Canada, where at various places it is planned to establish agencies for the Linn tractor. They plan to be gone about six weeks and with the Pullman of the highways equipped with every convenience they will occupy it much of the time during the trip, stopping at hotels only when they find it more convenient or desirable. 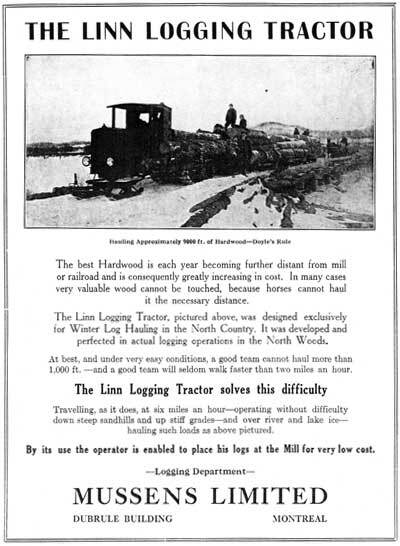 “The Linn tractor has many uses but it ever shines more brightly than when in use in big lumbering operations where the traveling is poor and there are big logs to handle. 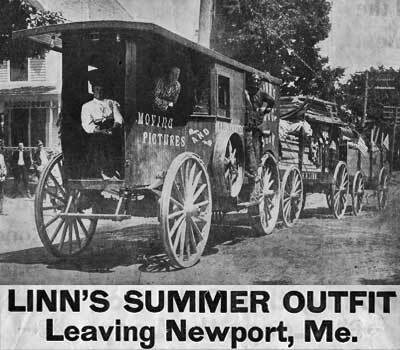 Many of them are now in use by some of the big lumbering firms in both Maine and Canada, but Mr. Linn is confident that this branch of the business can be largely increased and it is understood to be his plan to establish agencies at certain central points so that the business can be more expeditiously and satisfactorily cared for. “B. Taylor, representing Mussen of Montreal, Canada, passed through Oneonta last evening on his way from Morris to that city, having visited Morris to be certain that three tractors ordered by that firm would be shipped at once for use in Canadian logging operations this winter. The Mussen firm has nearly 30 Linn tractors in use in its Canadian operations and has found no other hauling equipment that will do the work. “ALMA, MICH., Aug. 9 –Republic Motor Truck Co., Inc., has purchased the entire capital stock of the Linn Mfg. Corp., Morris, N. Y., tractor manufacturer, and is now the sole owner of that company, including its plant, equipment, goodwill and exclusive selling rights. The operation of the Linn company will be continued at Morris as a division of Republic. The present personnel also will be maintained. Announcement of the purchase was made in Chicago by O. W. Hayes, president of Republic, following a meeting in the offices of M. Rothschild, chairman of the Republic board. “NEW YORK, Sept. 18 – National distribution of Linn tractors is contemplated by Republic Motor Truck Co., Inc., which has just announced a new issue of $1,250,000 ten-year 6 ½ per cent collateral trust sinking fund gold debentures in connection with the purchase of all the issued and outstanding capital stock of the Linn Mfg. Corp. of Morris. N. Y. “Sale of Linn tractors has hitherto been about 90 per cent confined to New York State. In view of the consolidation, distribution will be effected through 12 factory branches , 105 direct factory distributors in the United States, and 49 in 25 foreign countries, in addition to dealers appointed by distributors. “When H.H. Linn recently decided to make a trip from his home at Morris, N. Y., to the west coast he didn't pick up a time table and find out when the next westbound train left. He merely called in his chauffeur and told him to oil and grease his private car - a de luxe bus which is literally a highway Pullman. “This private bus is luxuriously equipped with all the conveniences of transcontinental trains, and Mr. Linn has found it much more to his liking for long distance traveling than railroads. Two comfortable double beds of the folding variety provide sleeping accommodations for Mr. and Mrs. Linn, as well as for the chauffeur and his wife. Electric power is furnished by a generator for lights, as well as for an efficient refrigerating plant, electric fan, electric heater—and also for an eight-tube radio which keeps the travelers In touch with affairs back east. A miniature bathroom, including shower, bath completes the homelike comforts. Comfortable reclining chairs afford relaxation against travel fatigue. “The rear end of the bus is equipped for office work, with desk, typewriter and files, here Mr. Linn conducts his business each day, maintaining constant touch with his home office. “Mr. Linn is vice president of the Linn Manufacturing corporation, at Morris, N. Y., manufacturers of Linn tractors. The Linn company was recently acquired by the Republic Motor Truck company, Inc., of Alma. Mich., and is now a division of that company. Mr. Linn is making a tour of the west in the interests of his company. He is the original designer and Inventor of the Linn tractor, which combines the outstanding features of the tractor with those of the heavy-duty truck. “Republic-Linn factory branches are located on the west coast at Los Angeles, San Francisco and Portland, and Mr. Linn is calling on each of these branches during his tour. He left New York State in November, 1927, stopping at Indianapolis, St. Louis, Tulsa, El Paso, and Phoenix. 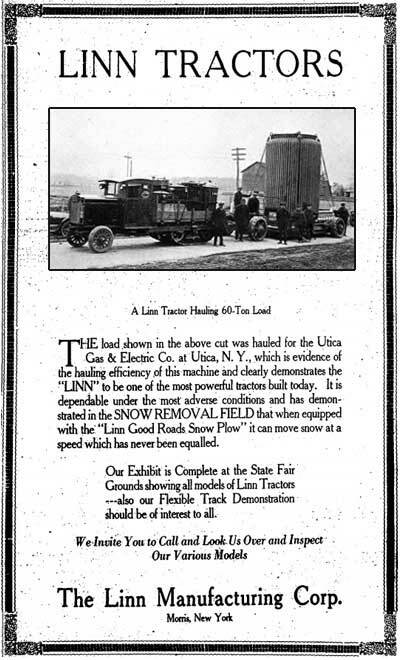 Coinciding with the sale to Republic, Linn entered into an arrangement with the Frink Snow Plow Co. of Clayton, NewYork to supply the tractor manufacturer with specially-designed snowplows. Up until that time Frink's plow used a single, full-height, non-elevating wing on the driver's side for pushing the snow farther back along the tractor. 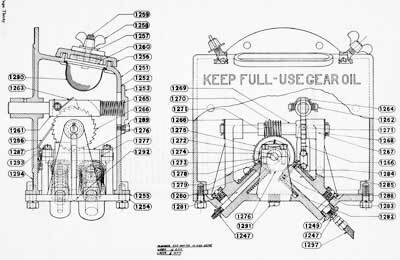 For the Linn, Frink developed a bi-lateral wing set-up which was controlled by as many as three operators riding in the Linn's equipment bed which was equipped with three steering wheels, one fore and two aft. 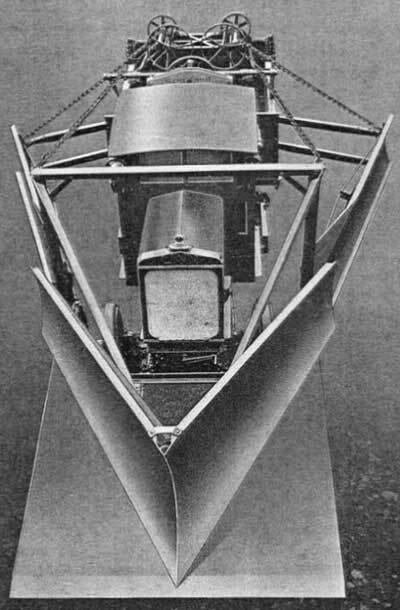 The front-mounted wheel at the center operated a baffle plate which rode along the roadway just beneath the central-V-blade; the left and right steering wheels at the rear controlled the angle and elevation of the 12-foot long, two foot high side blades. Shortly thereafter the steerable baffle plate (and its operator) was abandoned, the plate becoming a permanent part of the V-plow assembly. 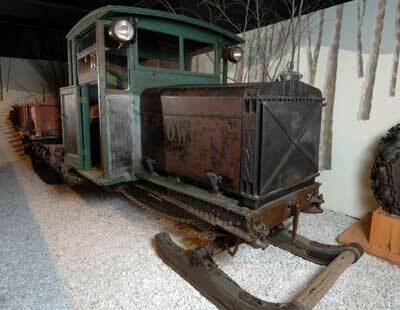 With the plow priced at $1,550 a fully equipped 1929 Linn-Frink snow plow was priced between $8,500 and $10,500, f.o.b. 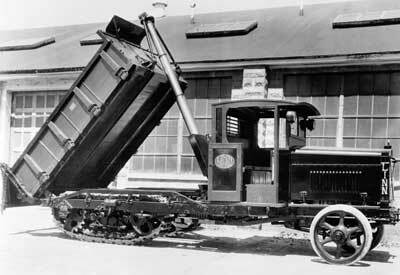 Morris, N.Y.
Frink's main competitor was the Sargent, a hydraulic V-plow with bi-lateral wings manufactured by the Maine Steel Products Co. of South Portland, Maine. Priced at $2,090 complete, the larger and heavier Sargent was the plow of choice in New England, and the additional cost could be quickly offset by the savings in manpower as the Sargent could be run with a single operator - the Frink required two. Following the acquisition Linn’s officers were as follows: G.R. Hanks, president (also v-pres. of Taylor Wharton Iron & Steel Co.); George Whitman, vice-president; H.J. Charles, treasurer (former pres. of Lombard); and Lincoln Johnson, treasurer. “The boards of directors of the Republic Motor Truck Co., Inc. Alma, Mich., and the commercial truck division of the American-LaFrance & Foamite Corp. have approved an agreement consolidating these two companies, it was annoucned yesterday. “This agreement is subject to ratification by the stockholders at a special meeting called for May 15. “The consolidation of these companies, which also includes the Linn Manufacturing Corp., of Morris, N.Y., a Republic Truck subsidiary, brings together two of the oldest and best-known truck companies in the industry. “Detroit, May 22 -The consolidation of the Republic Motor Truck Co., Inc., and its wholly owned subsidiary, the Linn Mfg. Corp. with the commercial truck division of the American-LaFrance and Foamite Corp., was completed a few days ago at a meeting held in the law office of Clark, Klein, Ferris, Cook & Williams, Detroit, and hereafter the new corporation will be known as the LaFrance-Republic Corp.
“The sales subsidiary will be known as the LaFrance-Republic Sales Corp. Preliminary details of this merger were announced in Automotive Industries, April 13. “The combined facilities of the new corporation make one of the strongest companies in the motor truck and tractor field. It has many branches throughout the country and a large number of distributors, both domestic and export. The line of heavy trucks manufactured by American-L aFrance and the lighter Republic vehicles gives the new company coverage over the entire motor truck field. As the corporate structure presented above indicates, H.H. Linn was effectively stripped of his management duties at Linn's Morris plant, and he took the opportunity to start another business. The Linn Trailer Corporation was organized in late 1929 and capitalized at $100,000 – The officers of the firm were: H.H. Linn, president; E.W. Wheeler, vice-president ; C.J. Smith, treasurer, and H.W. Naylor, secretary. All four men had been either investors in or employees of the Linn Mfg. Co. Originally from Boston, Edward William Wheeler had served as Linn Manufacturing’s chief engineer and purchasing agent. C.J. Smith was cashier of the First National Bank of Morris (N.Y.) and Howard Wing Naylor was the founder of the H.W. Naylor Co., a veterinary pharmaceutical manufacturer which is still in business today at drnaylor.com. Oneonta attorney D.J. Kilkenny served as the new firm’s attorney. The firm's product was an innovative one-wheeled automobile trailer that Linn had seen on a recent trip to France. It was currently being manufactured by a French manufacturer*, and Linn acquired a license to manufacture the trailer in the United States. 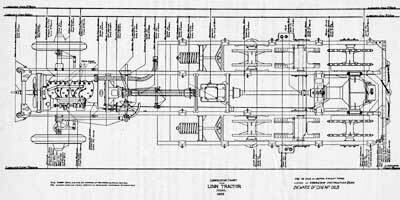 Linn applied for a US patent for his trailer on September, 10, 1930 and on July 31, 1934 was awarded Patent No.1968046 for his one-wheeled trailer, which he dubbed the "U-Can-Back" auto trailer. 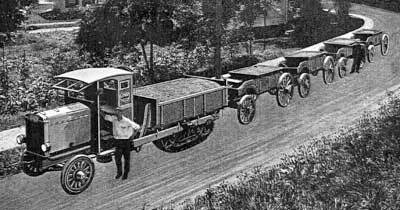 Advertising stated that the “New Linn Trailer … Backs Correctly With the Car.” Literature stated that the trailer had a weight capacity of 800 pounds, a remarkable amount considering its small size and single tire. The November 30, 1929 Oneonta Daily Star announced that:“Work has been completed on construction of the Linn Trailer factory at West End” The article went on to state that the modern 50 x 150 ft steel and brick structure had been built by local contractors and included “individual motors for all machines”. The article also stated that due to local interest a further $25,000 in stock was being made available to local investors. The outward appearance of the Linn changed little during its two decades of production save for the subsititution of cast steel wheels for the originally wooden-spoked rims - heavy duty Linns were equipped with two-piece steel rims and baloon tires somtime in the late 1920s. However notable inprovements were made under the skin, particularly in regards to power, speed and carrying capacity.Linn's distinctive, yet antiquated all-wood cab was remain the sole offering until 1939 when an all-metal cab, supplied by the Orrville Metal Specialty Co. of Orrville, Ohio, was offered as a n ectra-cost option. 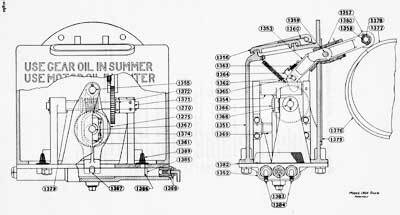 One welcome change was the reversing transmission which allowed an operator to run the Linn in reverse from a running-board mounted seat - using the same gears forward as back - which somewhat compensated for its ungainly 30-foot turning radius. Another time saver was the introduction of the self-dumping tailgate which was offered as standard equipment on Linn 5-yd dump bodies. In 1930 Linn Mfg. 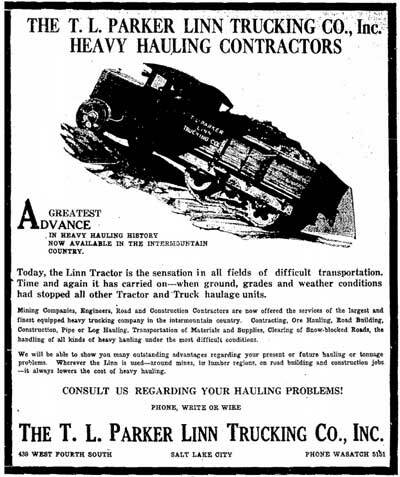 Corp.built a one-off purpose-built tractor-trailer to deliver Linn tractors, called the Linn Transporter. Constructed of mostly off-the shelf Linn components, the mostly conventional tow vehicle featured a heavy duty Meade-Morrison Winch mounted at the rear of the extra-wide cab which included a sleeping compartment that extended over the winch. behind the winch was a massive fifth wheel to which was attahced a drop-frame gooseneck trailer manufactured by Oneonta's Linn Trailer Corp. Equipped with bi-lateral 50-gal. fuel tanks, the Transporter could cruise at a reported 40 mph when loaded up with a trailer and a new Linn tractor. The original 6-cylinder Wauksha was replaced by a Cummins Diesel powerplant in 1935. Rene Elliot reports that the Transporter was retired in 1936 and sold it to the Musson Bros., an Otsego county tree surgeon, who equipped it with an articulated boom cherry-picker boom. “Pilot Carlton J. Hinman has been busy the past two or three days with the Stinson planes of H.H. Linn of Morris, meeting salesmen of the Linn tractor company of that village arriving to attend a sales conference which was held Monday and Tuesday. One party was met by plane at Albany, and yesterday afternoon Mr. Hinman flew to Morris in Mr. Linns’ cabin biplane and returned to Oneonta with his monoplane, leaving the biplane at the Linn field in Morris. “Harry H. Linn of the Linn Trailer Corporation and the Linn Manufacturing Corporation at Morris, hopped off from the Morris airport yesterday afternoon aboard his Stinson bi-plane, on a non-stop flight to Morridgewock, Maine. Carlton J. Hinman of the Oneonta airport was the pilot and they hoped to reach their destination before sundown. “H.H. Linn returned yesterday afternoon from Detroit, Mich., where he had been on a short business trip for the Linn Tractor Company at Morris with the Wood Hydraulic Hoist company, who are now developing a new heavy duty hoist. American-LaFrance's takeover of Republic coincided with a period of ill-health for H.H. Linn. Recently diagnosed with diabetes, Linn embarking on a 30-month sabatical where he traveled across the United States and Canada in the 'Linn Haven'. 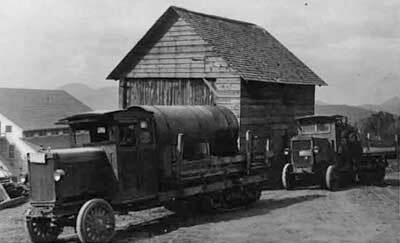 By 1931 he had grown bored of travelling and returned home to oversee the activities of his trailer company. He also returned to work at the tractor company serving as spokesman and consulting engineer. 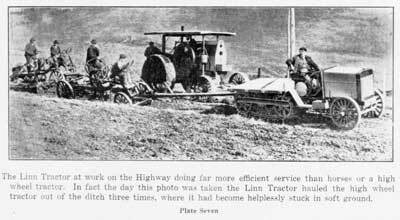 Approximately two-thirds of the 2,500 Linn tractors built between 1917 and 1935 were sold for highway maintenance or construction. Just as sales of Linn tractors to municipalities plummetted following the onset of the Depression, sales to contractors engaged in Federal projects increased as a direct result of President Franklin D. Roosevelt's 'New Deal' Public Works Administration. Between 1933 and 1936 several hundred Linn tractors were purchased by contractors engaged in projects overseen by the Army Corps of Engineers, U. S. Bureau of Public Roads and Tennessee Valley Authority. Some of the larger project included the construction of the Bonneville, Chickamauga and Grand Coulee Dams. Mississippi River levees and the trans-Alaskan Canadian Oil (Canol) pipeline. “The Linn Manufacturing Corporation, Morris, N. Y., has announced a new Sargent hydraulically operated snow plow designed especially for use with the Linn, to enable the Linn to apply its massive power for snow removal. Three levers lift the V and control the wings and both ends of the wing push arms. The power comes from a hydraulic pump mounted on the power take-off of the tractor. The wings may be kept flat for planing or sloped up for setting back the banks. Whatever their position at the top of the lift, they are always flat when on the ground. They can also be folded in out of traffic or lifted so high that an automobile can pass under them. 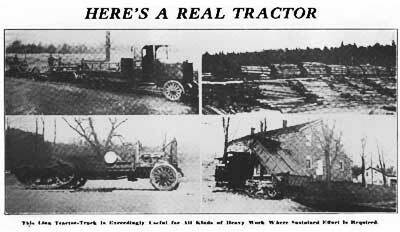 “The Linn tractors used by Mr. Kelly, logging contractor for S. Somers Lumber company have been brought in from Dayton, where they were in operation during the summer, and are being requisitioned for winter work in the town of Marion, where Mr. Kelly has been logging recently. 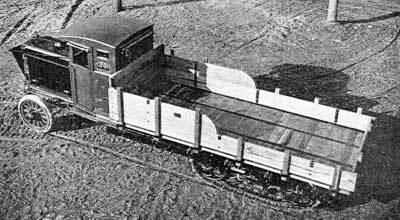 “The Linns have a caterpillar drive and haul 1500 feet at a load, or as much as an ordinary freight car. These immense loads are made possible by the use of trailers in summer or sleds in winter, in winter the front wheels are replaced with runners for operation in snow. “Mr. Kelley expects to run the trailers in two eight-hour shifts per day. The logs will be taken to Marion, where they will be loaded on cars on the Marion branch of the Great Northern. “Gods Lake Gold will have a big freighting job on its hands this winter. Some 5,000 tons will be taken in over the tractor road, and the tractor fleet will be increased from four to seven Linn tractors. 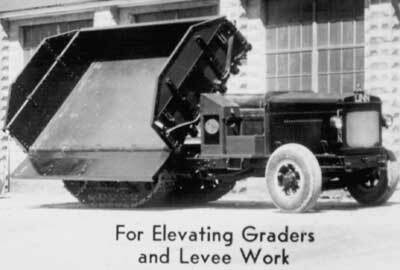 Despite several years of increased sales due to President Roosevelt's establishment of the Public Works Administration, increased competition from higher capacity earthmoving equipment manufactured byLa Tourneau and Euclid eventually brought Linn's contractor sales to a standstill. In the snow removal field competition was just as fierce and one municipality after another were trading in their Linns on four wheel drive equipment manufactured by Walter and FWD. In 1933 a redesigned (or more appropriately redesignated) Linn lineup - Model A, Model B and Model T - was introduced. 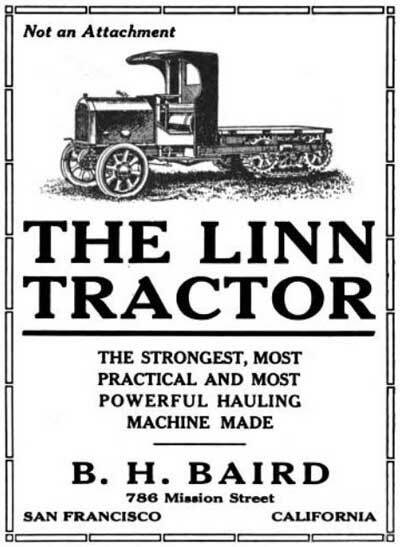 The Model A was the same 10-ton capacity tractor Linn had been manufacturing for almost two decades - albeit with more powerful engines supplied by Hercules and Cummins. 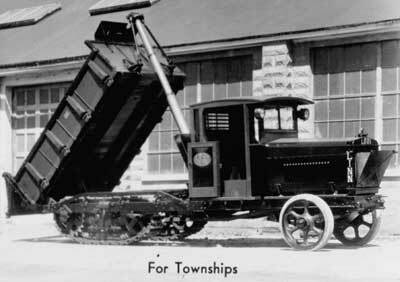 The Model B, or "L-37" as it was later designated, was a 20-ton capacity tractor which set upon an all-new heavy-duty frame specifically designed for the mining and construction industry. 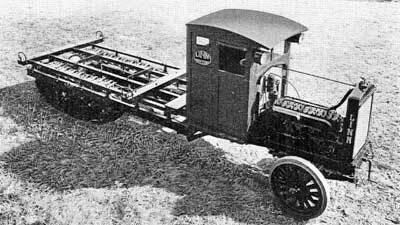 The Model B Linn came equipped with a forged I-beam front axle with two-piece cast rims and 9.75 x 20-inch 12-ply balloon tires. 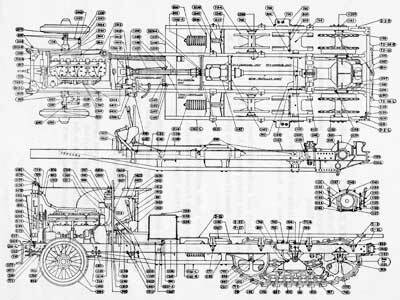 Also included was a 15 inch clutch, heavy duty four-or five-speed transmissions (which held 14.5 quarts of oil) and a double reduction rear axle at the rear of the bogie. The Model T Linns were military variants of the Model B constructed in the hopes of winning potentially lucrative government contracts. 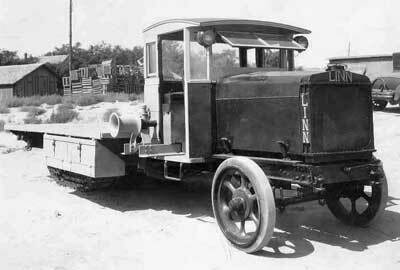 In June of 1933 the US Army evaluated a V-12 equipped Model T Linn for use as a cross-country heavy equipment transporter at its Aberdeen, Maryland proving grounds. Weighing in at 18,230 pounds, the purpose-built Linn was fitted with American-LaFrance’s 240-hp 754 cu. in. 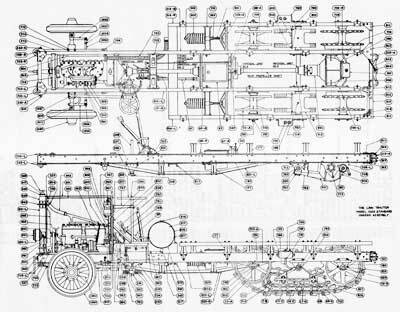 V-12 engine, which provided a pulling capacity of 8 1/2 tons (with a drawbar), or a combined carrying capacity of 8 1/2 tons while pulling an additional 7 1/2 tons. Late in the year Linn supplied the Army with a second Linn, designated the Model T-3, which shared the same basic specifications and V-12 engine of the earlier model, but featured an enclosed cab, a midship-mounted winch, and a steel cargo body with top bows and tarpaulin. 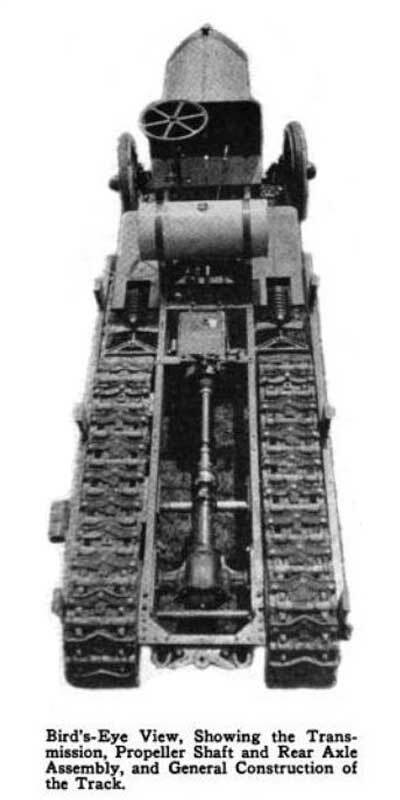 However, the Linn’s numerous drawbacks, which included an average cross-country speed of only 2 mph (20 mph over the highway), turning circle of 65 feet (unlike a regular crawler the Linn lacked the capacity of braking the inside track to assist in turning), and excessive noise caused by unlubricated tracks and un-muffled engine quickly put the T-3 Linns out of contention. In July of 1934 Linn delivered the T-3’s successor, the T-6, to the Army’s Aberdeen proving grounds for another evaluation. The T-6 featured a redesigned track system that allowed it to turn around in only 36 feet, half the diameter needed by the T-3. The T-6’s extra-wide frame now fully encompassed the track assembly, which was connected via a new 5-speed transmission to the 174-hp 935 cu. in. Hercules engine. The road wheels of the redesigned 14-inch wide tracks (i.e., the wheels which rolled over the track as it lay still against the ground) were filled by a smaller wheels-on-a-track assembly which moved around its own idler and roller assembly just as the outer track did. The re-engineered tracks increased the T-6’s cross-country speed to 10 mph, although its highway speed was slightly reduced (15 mph) when compared to the 1933 Linn T-3. Unfortunately the re-engineered tracks were even noisier than its predecessor and despite its increased carrying capacity and maneuverability the government did not approve the T-6 for production. 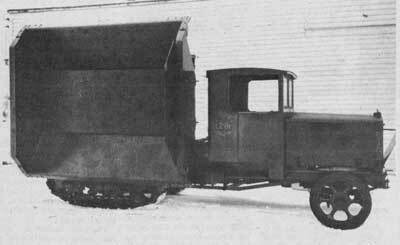 In 1935 Oneonta's Linn Trailer Co. developed a tracked trailer with a 25 yd side-dumping body to be towed behind a standard Linn tractor for the Easton Car & Construction Co. of Easton, Pennsylvania - it was the only known sale of such a unit, which was listed in the Linn catalog as the Model37-T tracked trailer. “Fourteen men, four trucks and a grader were assigned to snow and ice removal and clearance of catch basins in city streets today by Commissioner Justin P. Gates of the Department of public Works. Meanwhile department employees made test runs with the new Linn tractor-truck plow in several streets in the Randall tract in the South end of town, to familiarize themselves with its operation. 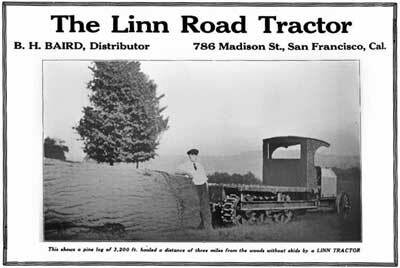 During the 1930s Linn took a number of used Linns in on trade, which allowed cash-strapped municipalities to purchase a re-furbished tractor at a substantial discount. 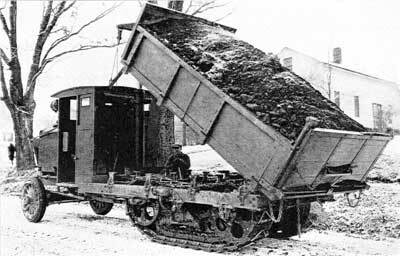 One such unit, equipped with a Frink plowing outfit was sold to the Monroe County, New York town of Perinton in 1937 for $2,950.00, a quarter of the cost of a brand-new Linn-Frink outfit. “Oneonta, July 3. — Three persons died in flames and a fourth was gravely injured today when a Syracuse-bound airplane crashed and burned at a private landing field owned by Holman H. Linn, 12 miles from here. MR LINN, 60, of Morris, Otsego County, founder of the Linn Manufacturing Company, trailer manufacturers, and owner of the four-passenger cabin monoplane. CAPT. GEORGE STEAD. 43, of Norwich, Army Air Corps reserve flier and pilot of the plane. MRS. DOROTHEA HANSEN, 30, of Endicott. “Mrs. Hanson's husband. Arthur 34, foreman of the assembly department of the International Business Machines Corporation at Endicott, the only occupant who succeeded in escaping from the blazing plane, was reported in serious condition at the Mary Bassett Hospital at Cooperstown. The accident occurred at what is known as Patrick's Hill, when the motor stalled after the plane had attained an altitude of approximately 300 feet. “State Police said that Pilot Stead swung the ship about and started to nose down after the motor had stalled. The motor started again, and Stead resumed his course. The plane struck a tree at the edge of a clearing and came down in a mass of flames, State police said. The Hansens had been visiting Mrs. Hansen's father Charles G. Stone, superintendent of the Linn factory, and had gone along for a ride when Linn and Stead set out for Syracuse on a brief business trip. State police said that person in the Linn home expressed belief that Linn had intended to come to Syracuse to purchase an automobile. “The crash occurred at 2:30 o’clock Saturday afternoon. Only meager official reports were available for several hours after the accident. Lieut. J.J. Warner of State Police at Sidney said the first report received by troopers came in a telephone call from Private Edwin Wheeler of the Fourth Signal Corps Field detachment from Mitchell Field. A State police patrol was dispatched to the scene over traffic-clogged highways. Meanwhile, the Morris Fire Department was summoned. A water pump truck was unable to reach the scene until a tractor was used to haul the truck up the hill to the wreckage. The plane was destroyed by flames. State police were forced to wait several hours until the wreckage cooled in order to recover the charred bodies of the victims. “According to State police, Linn, Stead and Mrs. Hansen were trapped in the cabin while Hansen apparently leaped from the flaming plane, collapsing after running a few feet. He was picked up by George Wetman, who resides near the scene. Wetman placed Hansen in an automobile and drove to the hospital at Cooperstown. “From the other side of the valley, Mrs. Linn, driving home from Morris, saw the takeoff and the crash. ‘I knew immediately what had happened,’ she said later, ‘I drove to the field, but there was nothing I could do, so I went into the house. Mr. Linn always used an airplane on his business trips,’ she added. “Another eye-witness was Lee Bryant, Oneonta vacuum cleaner salesman, who said he was driving past the field on his way to an appointment at the Linn home. Bryant found Hansen, the sole survivor, wandering about near the wrecked and burning plane, and led him off the field. “Dr. Norman Getman. coroner, permitted the removal of the bodies to an undertaking establishment in Morris. Meanwhile, state police guarded the burned plane pending the arrival from Buffalo of John Somers, Department of Commerce inspector. Somers flew from Buffalo to Sidney, near the crash scene. “Linn, a native of Washburn, Me., came to Morris in 1917, and subsequently established his trailer manufacturing business. Several years ago he constructed a hangar and field on ‘Patrick's Hill’ near his home to facilitate his use of airplanes in business trips. Without Linn, who had returned to the Morris firm bearing his name in 1931 as vice-president in charge of engineering, the Linn Manufacturing Company continued its downward slide. Shortly thereafter Linn Mfg. Corp. officials hired consulting engineer, Philip W. Sloan, to design a new model they hoped would save the company. 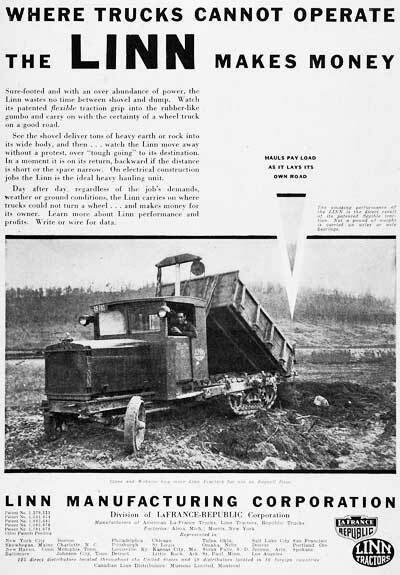 Sloan's solution was an innovative vehicle, designated the Linn C-5, that company officials hoped would bridge the gap between the truck and crawler-tractor. Sloan had been the chief engineer of the Schacht Truck Co. of Cincinnati, Ohio, and many of the components of the C-5 were sourced from the recently shuttered Ohio truck manufacturer. 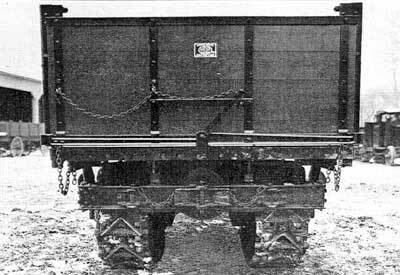 While the C-5 appeared to be a standard cab-over-engine (COE) truck at the front (albeit with double tires) , the drive assembly at the back was unique, in that both a half-track mechanism and a conventional rear axle were fitted. It featured both front wheel and track drive with a pair of wheels mounted behind the crawler. On hard surfaces it could operate as a front-drive truck. In rough terrain hydraulics raised the rear wheels and lowered the tracks providing tremendous pulling power on all types of surfaces. 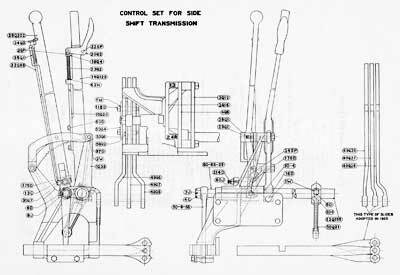 “The Linn Manufacturing Corporation, Morris, New York, has announced a new type of haulage unit, known as the Model C-S, which can be instantly converted from track to wheel operation, or vice versa, merely by throwing a control lever mounted at the driver's position. “Body capacity is five tons, and the chassis weight, with cab, is 11,500 lbs. The engine is a 6-cylinder Hercules rated at 105 hp. Operating on dual pneumatic tired wheels, the vehicle has seven inches of road clearance under the traction unit. “In this position, the drive is on the front wheels; the traction unit idling, and merely revolving should it hit an obstruction. The load distribution is equal on front and rear wheels, with a maximum speed of 35 m.p.h. When track operation is desired, the operator merely pushes the control lever and the rear wheels are raised hydraulically. The wheels can be raised to allow nine inches of road clearance, or they can be allowed to trail or float behind the traction unit. “In hauling from pits, for example, the C-5 will come up out of the pit unaided with its own load, and on its own tracks at 12 m.p.h. ; and when it reaches good road. It can roll away at 35 m.p.h. on rubber. In addition, it will do those jobs requiring steady track operation, or others requiring only wheel operation. If hauling is to be over good roads for any protracted period, the entire traction unit is readily removed and stored. “Timken roller bearings carry the upper ends of the spiral screw shafts and cutless rubber bearings are used at the lower ends of the shafts which are subject to abrading action of the sand and water. In March of 1939 a prototype Linn C-5 was delivered to the US Army’s Aberdeen, Maryland proving grounds for evaluation as a potential 155mm artillery prime mover. Rated for 5-tons carrying capacity, the C-5 was powered by a 104-hp, 478 cu. in. Hercules inline 6-cylinder engine that passed power to either the front axles or the 18” wide pair of rear tracks via a Spicer transfer case and Fuller 5-speed transmission. The 17,760 pound Linn C-5 was 94 inches wide, 94 inches high and 20 feet long with dual 12-ply 8.25 x 20-in. tires mounted at all four corners. “The Linn Mfg. Corp., producer of heavy duty tractors, will begin operations in Buffalo, N. Y., in about two months. The company, which will move its manufacturing facilities from its present location in Morris, N.Y., has taken over a plant formerly occupied by the Fowler & Union Horse Nail Co. The property consists of 7½ acres and a modern one-story factory with 77,000 sq. ft. of floor space. “In addition to the 40 carloads of equipment and machinery that it will move to Buffalo from Morris, the Linn Co. will purchase about $100,000 worth of new machinery and equipment. The handful of C-5's that had been sold to the public were experiencing their own problems and it soon became apparent that further testing should have preceeded customer deliveries. The September 27, 1939 death of Wallace J. Childs, chairman of American-LaFrance (and the C-5's main benefactor) only served to compound the problems, and the Buffalo plant was quickly abandoned with C-5 production returning to Morris. A significant number of early C-5 purchasers were so disatisfied with their 'CaTruks' that Linn took them back and refunded their money. These included five C-5 logging units purchased by the U.S. Forestry Service for use near Concord, Massachusetts, as well as a road maintenance unit purchased by the Green County, New York, Town of Jewett. Among the main complaints of failed drivetrain components others complained of the unsettling feeling experienced when the rear wheels were replaced by the tracks at speed. 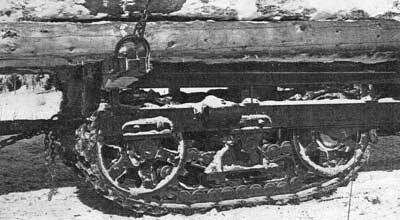 The C-5-specific track system enjoyed significantly less grip than a standard Linn L-37 and when used on snow the smaller cleat openings quickly clogged up with snow and ice, causing a loss of traction. 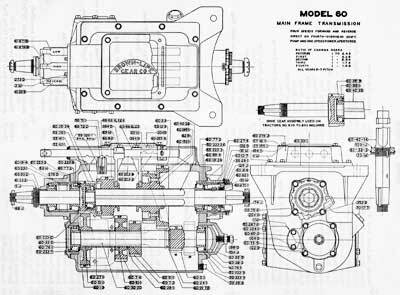 Sloan also modified the C-5 layout, moving the motor 18 inches forward to improve weight distribution and reduce heat build-up in the cab. The move forward resulted in a revised front-end whose louvered nosepiece tried to conceal the re-mounted engine and radiator as best as it could. Sloan's marginally-revised Linn C-5 returned to the Aberdeen proving grounds in September of 1940. Unfortunately, it continued to be plagued by its rough ride (even when on wheels), low maximum speed, and the inability to tow a 155mm gun, the Army's chief requirement. Consequently no military orders for the C-5 ensued and production of the C-5 was put on haitus for the duration of the war, with the total number produced from 1939-1947 estimated at fewer than 30 examples. 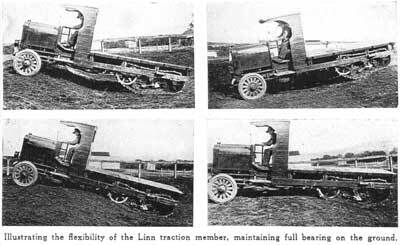 Ernest Leigh Portner reports that several rotary plows were tried on Linn tractors. 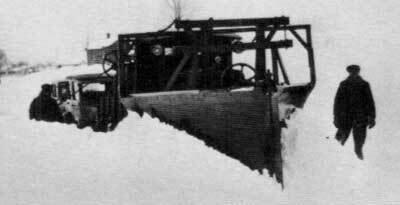 The 'Snow King', a light railway plow which featured dual outboard paddlewheels fed by a central V-blade plow - seen to the right - was constructed by the Rotary Snowplow Co. of Minneapolis, Minnesota. 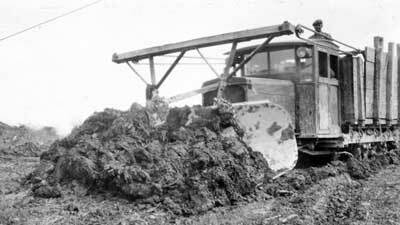 The second, constructed in 1940 by the Rome Grader Co., of Rome, New York, featured an articulating rotary blower mounted in front of a V-blade plow. Portner's father, who held a snow removal contract with Oneida County, tested the prototype, which ultimately proved unsuccessful due to its slow speed and inability to go through hard-packed snow. A handful of refurbished Linn L-37-type tractors would play an important role in the development of the Gradall telesoping excavator. 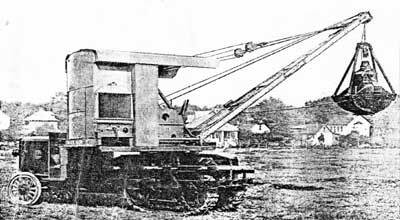 In 1941 Ray and Koop Ferwerda, principals of Cleveland, Ohio's Ferwerda-Werba-Ferwerda construction company, commenced construction of a telesoping boom excavator (considered the very 1st Gradall) using a government surplus dump truck chassis. They continued to improve the design during the War and in late 1943 commenced construction of a second prototype using a used Linn tractor as its carrier - the finished product debuting as the Gradall on May 6, 1944. Three more secondhand Linn L-37s served as carriers for the next 3 Gradall prototypes, after which the Ferwerda brothers sold the rights to manufacture the Gradall to Cleveland's Warner & Swasey Co. 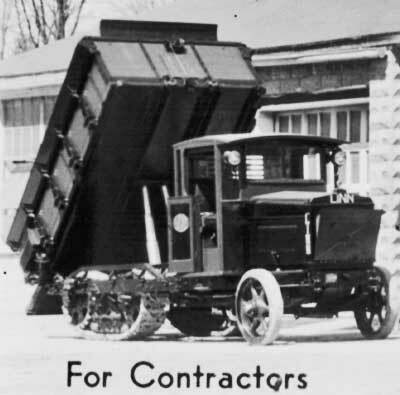 Although Warner & Swasey had tested the Gradall on a Linn C-5 CaTruk carrier, its dual-tired axles were too wide for Ohio regulations and they determined that a low-priced Gradall unit - built on a cheap Army surplus truck instead of an expensive Linn C-5 - would be more attractive to potential dealers and customers.Consequently the first production Warner & Swasey-built Gradall, the M2400, debuted in 1946, mounted - like most early units - on an Army surplus 6x6 truck. In late 1944 Linn created a pair of long-wheelbase Linn L-37 tractors which were equipped with a hydraulic platform lifts topped off with an inflatable rubber cushion that would serve as tow vehicles for disabled B-29 bombers. Two Linns were required to lift each B-29 - the pair joined together by detachable braces that kept the tractors operating in unison. Testing commenced on the specially-outfitted Linns at the US Naval Air Station at Patuxent River, Maryland in early 1945, but the end of the war caused the entire program (20 pairs of tractors were reportedly on the books) to be cancelled. At War's end the Linn Mfg. Corp. found itself with a handful of returned C-5 CaTruks and a large parts inventory. Nobody was interested in purchasing a new C-5, albeit a used one, so some clever minds decided to rebuild the remaining C-5's into a seemingly all-new model, the C-6. By removing the rear axle and substituting a conventional front end for the dual-tired front-wheel-drive unit the C-5 became the C-6. Linn supplied a C-6 to the U.S. Navy for evaluation, but once again no orders were forthcoming. C-6 sales were disappointing save for 25 units delivered to the International Hoist & Derrick Co. for use in the Russian oil fields. The last units were completed in 1948 with an estimated 30 Linn C-6's having been assembled to date. American-LaFrance closed down the Linn shops in December of 1949 and its assets were liquidated at a December 15, 1949 auction. Harold Mills, Linn's former treasurer, and Maurice Bridges, a partner in Gould & Bridges, Morris' Linn and Walter distributor, bought the Linn factory and most of the parts and equipment for pennies on the dollar. 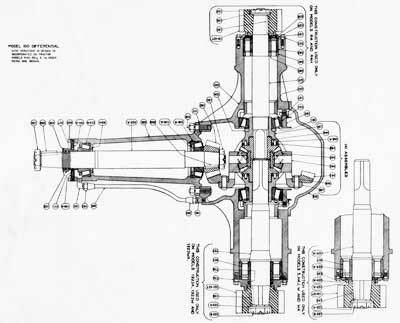 Mills and Bridges constructed two final C-6's from parts on hand hwich were sold to the former Seattle, Washington Linn distributor, and managed a Linn parts and service facility for most of the next decade, calling it quits in 1959. “Richmondville - Charlie Bilby primes with gasoline each of the six cylinders of the 170 horsepower engine of the 1935 Linn Tractor, climbs into the cab and presses the starter button. The clank and clang of the engine echo throughout the valley, jolting the tractor's nine tons of iron and steel. ‘That's the greatest thrill, hearing that engine turn over,’ Bilby says. “Grasping the iron steering wheel with both hands, he engages the clutch, shifts into first gear and steps on the accelerator. The Linn lurches forward as the clattering roller chain turns the track. “‘You can feel the power when you step on the gas,’ says Bilby, noting that though the Linn's top speed is only about 8 mph, its engine produces a powerful surge of energy. 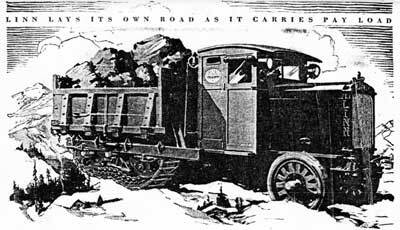 “Yet the Linn ‘half-track,’ as it was later dubbed -- with its front wheels and rear bulldozer-like tracks -- wasn't made for speed. It was built for power and strength, for hauling tons rock, marble, road construction materials, and for plowing unpaved rural roads. 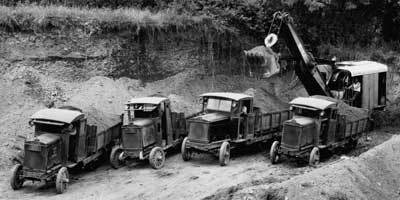 “In its heyday, this hybrid truck and track-driven machine was the workhorse of the construction industry, used in building dams, in copper mining, in marble quarries and logging. 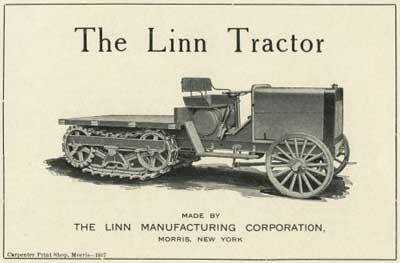 The Linn Tractor was also used on farms -- with up to five plows attached -- to plow fields. 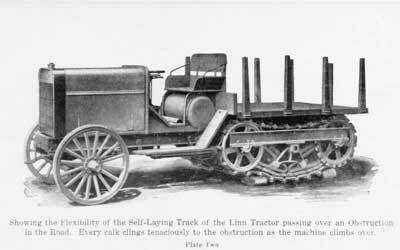 “The Linn Tractor, says Bilby, was a precursor of earth movers manufactured by Caterpillar and other firms that improved on Linn's traction unit design, with is flexible track system for easy travel over difficult terrain. 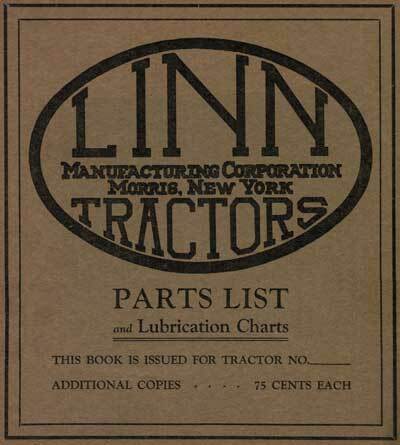 “Designed by Holman Harry Linn, who formed the Linn Manufacturing Co. in 1917 in Morris, Ostego County, the Linn Tractor was custom-built machine with an average retail price of $20,000. In its early years, the Linn was powered by gasoline. Later models were available with diesel engines. Linns were equipped with four and six cylinder Waukesha engines, six cylinder Cummins diesel engines and later Hercules engines. “While earlier engines would accelerate the Linn to about 8 mph, the Hercules increased it to 12 mph. Linn transmissions provided four speeds both forward and backward. “The Linns are about 25 feet long and 7 feet wide. 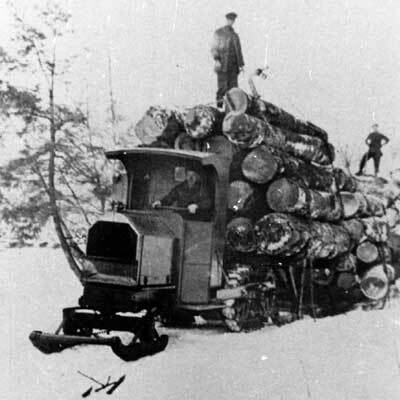 Many of the Linns were used in the logging industry, where sled-type skis replaced the front wheels in winter and logs loaded in a train of trailers were pulled by the tractor. “In 1927, the Republic Motor Truck Corp., a Michigan-based firm, purchased Linn Manufacturing and continued to operate it in Morris as a subsidiary while retaining its name. “During the 1930s and 1940s, the Linn Tractor was used in construction of dams, such as the Grand Coulee Dam on the Columbia River in Washington state, for maintenance work on the waterway in the Panama Canal Zone and in many Tennessee Valley Authority projects. 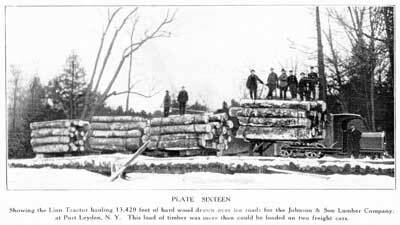 Linns also were extensively used in the logging industry in the Adirondacks. “Bilby, a maintenance employee at the State University of New York College at Cobleskill, says his fascination with the Linn tractor began when he was a youngster watching the machine plow snow along the back roads of Schoharie County. “‘I still remember seeing the Linn coming down the road from a long way off, and even after it was out of sight, you could hear the roar of the engine and the clatter of the track,’ he says. “His father was a ‘wing man’ on a Linn. Huddled against winter's cold winds in a small shed attached to the dump box and outfitted with a kerosene heater, Bilby's father raised and lowered the wing plows with control levers. The levers were later modified to operate from the cab. “‘When they were plowing with the wings out, it stretched about 21 feet wide, the average road was probably narrower between stone walls,’ Bilby says. “Cleats were attached to the tracks to prevent sliding on the snow- and ice-covered roads. It took two men two days to fasten the cleats. “‘It was quite a sight to see,’ says Bilby, who recalls watching the Linn clear the high snowdrifts. After each attempt to dislodge deep layers of hard-packed snow with the front-mounted V-plow, the driver would back up and buck against the drift, back and forth until a wide path opened. “Never forgetting those early images of the Linn Tractor in action, Bilby, whose longtime hobby is restoring early gas-powered engines, found his first Linn about 11 years ago, a 1924 machine abandoned by a town highway department. 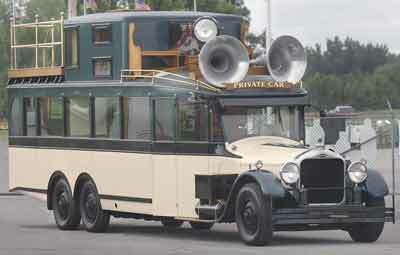 He restored it and has taken the Linn to exhibitions of vehicles and machinery of yesteryear. “Bilby has accumulated a dozen Linn Tractors -- built between 1924 to 1946 -- most of them once used by town highway departments in Schoharie and several other nearby counties. He found them in town barns, garages, landfills, fields, in various stages of rust and corrosion. He restored the engines on a few and replaced parts and adjusted the tracks so they would operate. “Recently, he restored a 1935 Linn for a town in Sullivan County in exchange for two other Linns -- a 1933 gas-powered and a 1946 diesel-powered Linn, with metal cab and body. “Restoring the 1935 Linn took two years and the help of his nephew Rob Bilby, who restored the tractor's electrical system. “After failing to free the pistons with solvent, he dislodged them by using a 20 ton hydraulic jack that squeezed a plug against the pistons to drive them through the cylinders. Though he had to replace the piston rings and make new head gaskets, the bearings simply needed a good cleaning. “Bilby ordered some engine parts from a man in Ohio who maintains an inventory of parts used in Linn engines: others he fabricated or found in the scrap yard. Bilby has the technical manuals, including drawings and diagrams, for repairing the tractors. “Bilby also repaired the hydraulic system that operates the plow, mounted new side lights, replaced the windshield and back window of the cab, mounted new tires. He cleaned and adjusted the track mechanisms and repainted the metal parts black. “He then replaced rotted wooden doors, roof slats of the cab and dump body with white oak planks and painted them green, the Linn's original color. He had a new decal printed for the side of the cab, to match the original company logo. “Linn Manufacturing stopped making the tractors in the early 1950s, but would accept used tractors as trade for highway equipment, such as sanders and snow plows, Bilby said. “‘The company would cut the engine from the rest of the tractor, rebuild it and sell it for use at power plant,’ he said, noting he has several of the engines, two that were used in sawmills, one that operated a ski tow and another that operated a water pump that made snow at a ski resort. “Meredith McNeil, professor of agricultural engineering at SUNY Cobleskill, who also has a special interest in Linns, agreed. “‘Time finally outran the Linn company. 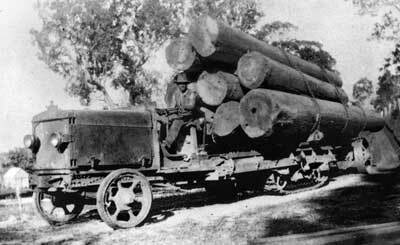 They built a machine that served the logging, construction industry and highway industry at a time when speed wasn't important. The Linn was slow but rugged beyond belief. But in the late 1940s and early 1950s, America really began to move technologically. So, speed-wise, the Linn Tractor was outdated’. “Bilby says he's still looking for Linns to add to his collection and continues to comb the countryside for rusting machinery in former town landfills, barns and junkyards. He also checks out reported sightings of Linn Tractors by folks who have seen his restored 1924 Linn Tractor at a gas-up or antique car exhibit. “Ernie Benson of Worcester recalls what it was like seeing a Linn plowing the roadway from Dorloo to Hyndsville in Schoharie County in the winter of 1945, when he was 7. “Stopping by to admire Bilby's restoration of the 1935 Linn Tractor and hearing the start, brought back memories for Benson of the thrill of watching the tractor plow through the snow. Pictures are continued on the next page - click here for more! US1685676 – Tractor - ‎Filed May 13, 1924 - ‎Issued Sep 25, 1928 to Holman Harry Linn assigned to Linn Mfg. 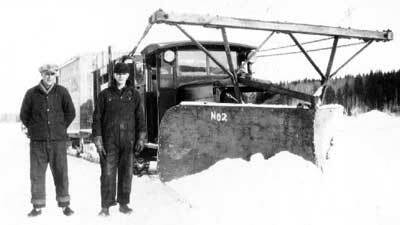 Corp.
US1701979 – Snow Plow - ‎Filed Nov 17, 1926 - ‎Issued Feb 12, 1929 to Holman Harry Linn assigned to Linn Mfg. 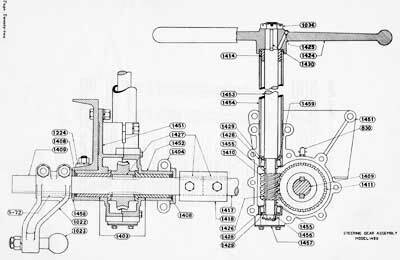 Corp.
US1835506 – Universal Joint - ‎Filed Apr 2, 1928 - ‎Issued Dec 8, 1931 to Holman Harry Linn assigned to Linn Mfg. Corp.
US1685641 – Vehicle Drive - ‎Filed Apr 2, 1928 - ‎Issued Sep 25, 1928 to Holman Harry Linn assigned to Linn Mfg. Corp.
US1794630 – Construction for Automobile Trailers - ‎Filed Aug 20, 1928 - ‎Issued Mar 3, 1931 to Holman Harry Linn assigned to Linn Trailer Corp.
US1809344 – Tractor - ‎Filed Aug 27, 1928 - ‎Issued Jun 9, 1931 to Holman Harry Linn assigned to Linn Mfg. Corp.
US1858154 – Tractor - ‎Filed Dec 11, 1928 - ‎Issued May 10, 1932 to George R. Hanks assigned to Linn Mfg. Corp.
US1877516 – Head Casting for Radiators - ‎Filed Oct 8, 1930 - ‎Issued Sep 13, 1932 to Holman Harry Linn assigned to Linn Mfg. Corp.
US1895387 – Logging Bolster - ‎Filed Feb 20, 1930 - ‎Issued Jan 24, 1933 to Holman Harry Linn assigned to Linn Mfg. 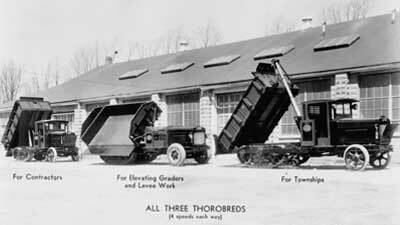 Corp.
US1903629 – Vehicle Brake - ‎Filed Apr 2, 1928 - ‎Issued Apr 11, 1933 to Holman Harry Linn assigned to Linn Mfg. Corp.
US1915325 – Automobile Trailer Construction - ‎Filed Oct 29, 1929 - ‎Issued Jun 27, 1933 to Holman Harry Linn assigned to Linn Trailer Corp.
US1953051 – Trailer Construction - ‎‎Filed Oct 1, 1930 - ‎Issued Mar 27, 1934 to Holman Harry Linn assigned to Linn Trailer Corp.
US1953053 – Trailer Construction - ‎Filed Feb 14, 1931 - ‎Issued Mar 27, 1934 to Holman Harry Linn assigned to Linn Trailer Corp.
US1953052 – Trailer Construction - ‎Filed Feb 14, 1931 - ‎Issued Mar 27, 1934 to Holman Harry Linn assigned to Linn Trailer Corp.
US1954637 – Vehicle Construction - Grant - ‎Filed Jun 4, 1931 - ‎Issued Apr 10, 1934 to Holman Harry Linn assigned to Linn Trailer Corp.
US1959168 – Vehicle Construction - ‎Filed Nov 10, 1931 - ‎Issued May 15, 1934 to Holman Harry Linn assigned to Linn Trailer Corp.
US1968046 – Trailer Construction - ‎Filed Sep 10, 1930 - ‎Issued Jul 31, 1934 to Holman Harry Linn assigned to Linn Trailer Corp.
US2023330 – Gate Control For Dump Vehicles - ‎Filed Dec 10, 1930 - ‎Issued Dec 3, 1935 to Holman Harry Linn assigned to Linn Mfg. Corp.
US2027989 – Dump Body For Vehicles - ‎Filed Sep 30, 1931 - ‎Issued Jan 14, 1936 to Holman Harry Linn assigned to Linn Mfg. Corp.
US2070015 – Track Trailer - ‎Filed Mar 25, 1935 - ‎Issued Feb 9, 1937 to Holman Harry Linn assigned to Linn Mfg. Corp.
US2341883 – Convertible Vehicle - ‎Filed Jul 13, 1940 - ‎Issued Feb 15, 1944 to Philip W. Sloan assigned to Linn Mfg. Corp.